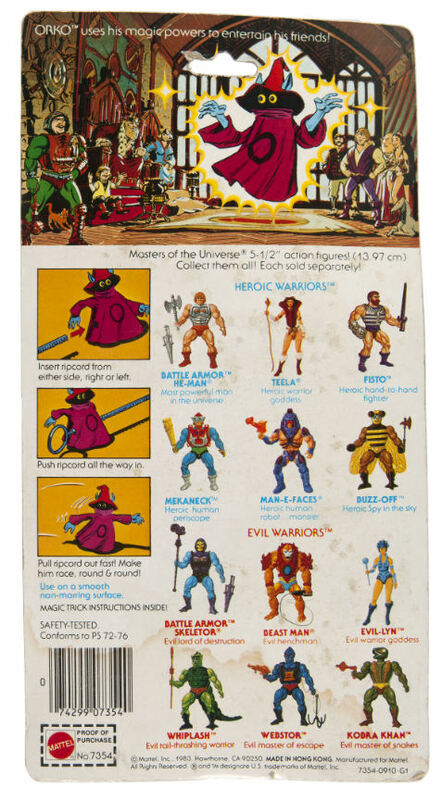 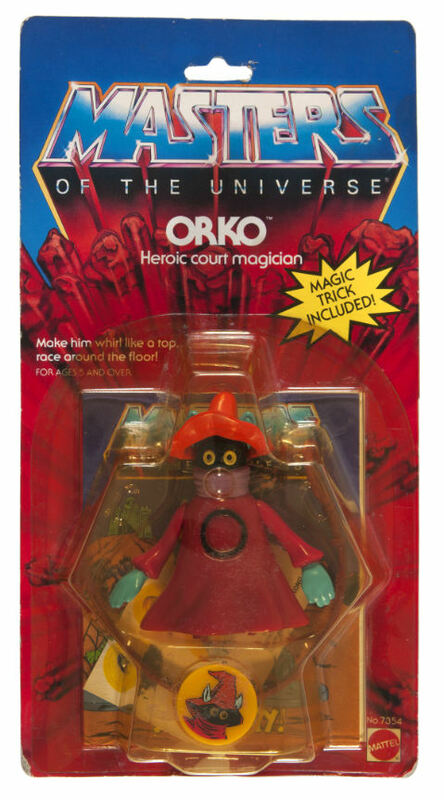 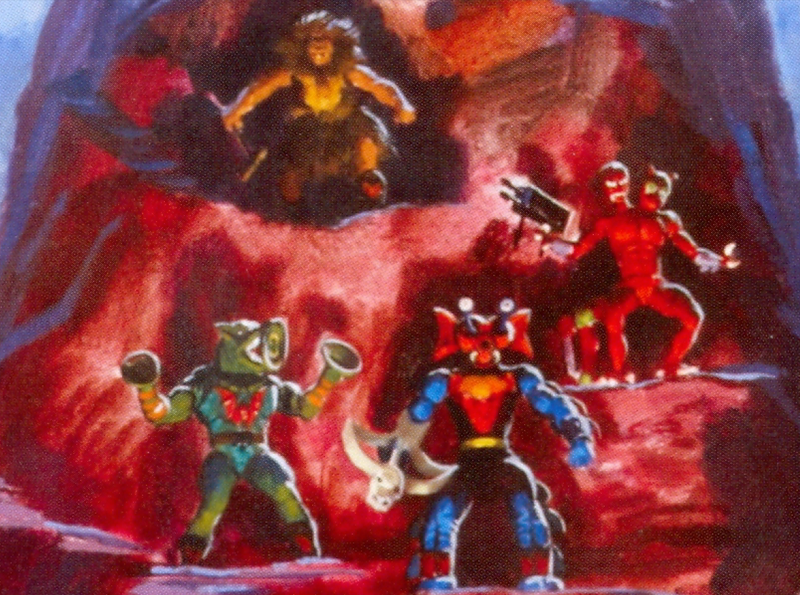 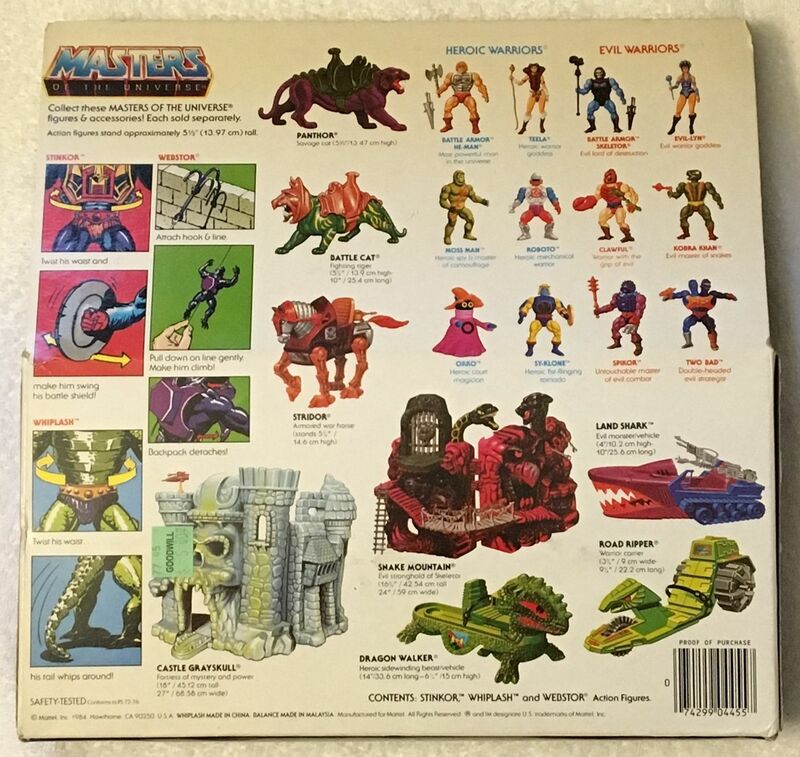 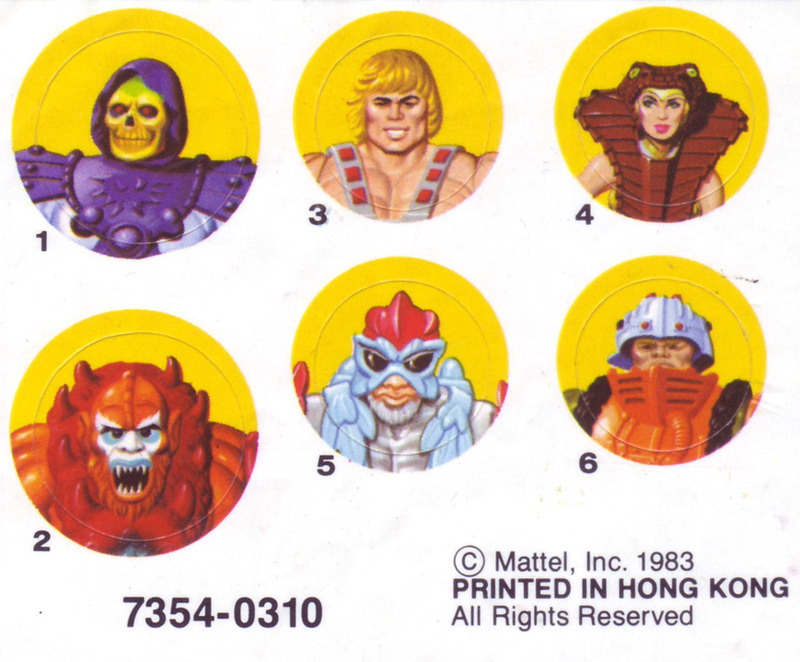 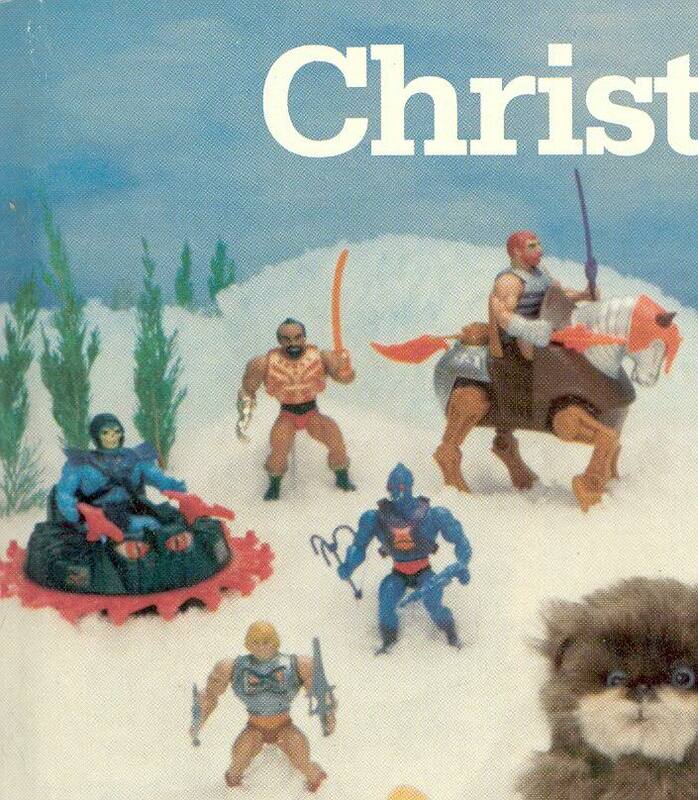 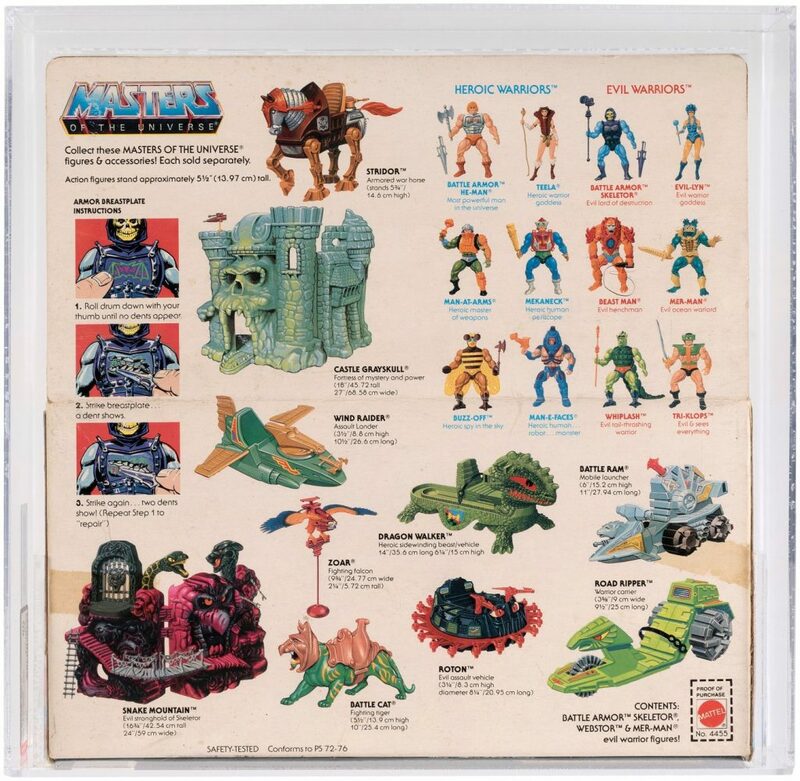 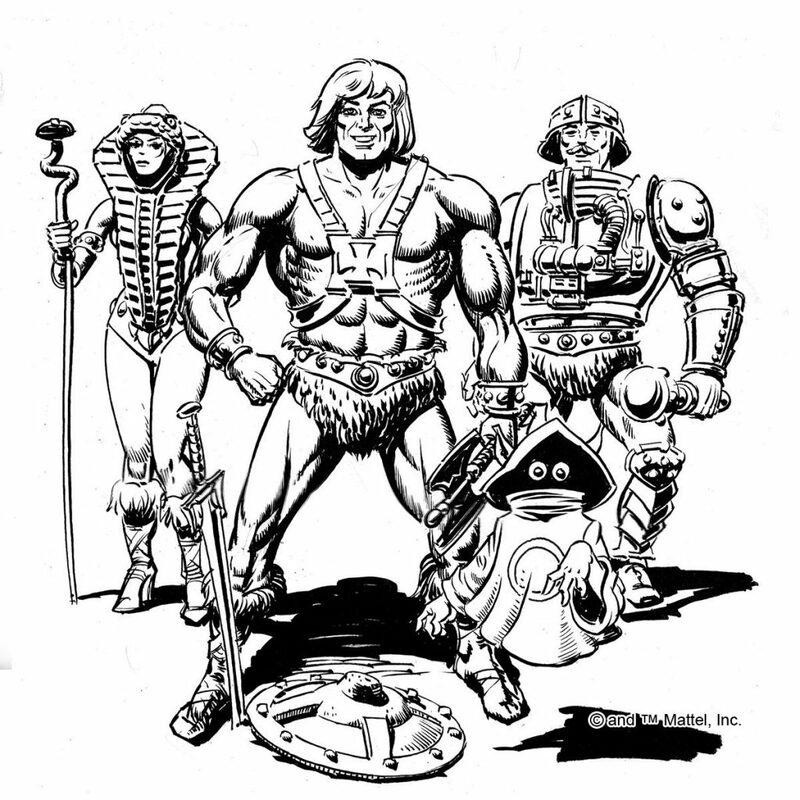 This blog has been greatly enriched by contributions from people all over the community, including artists, designers, archivists, collectors and general MOTU experts. 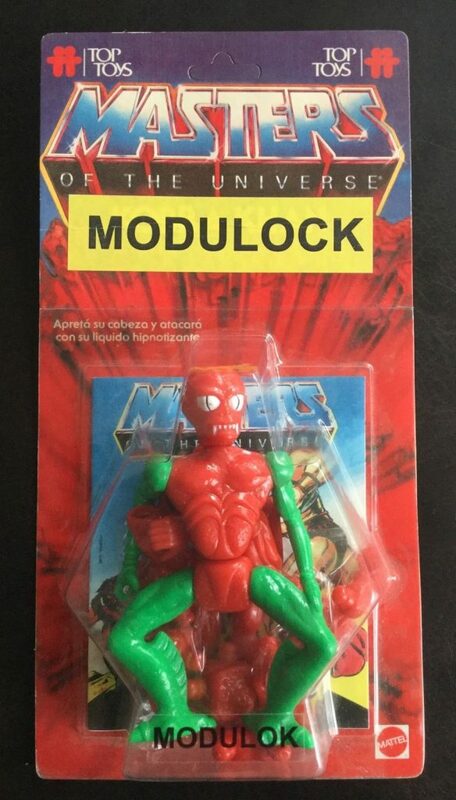 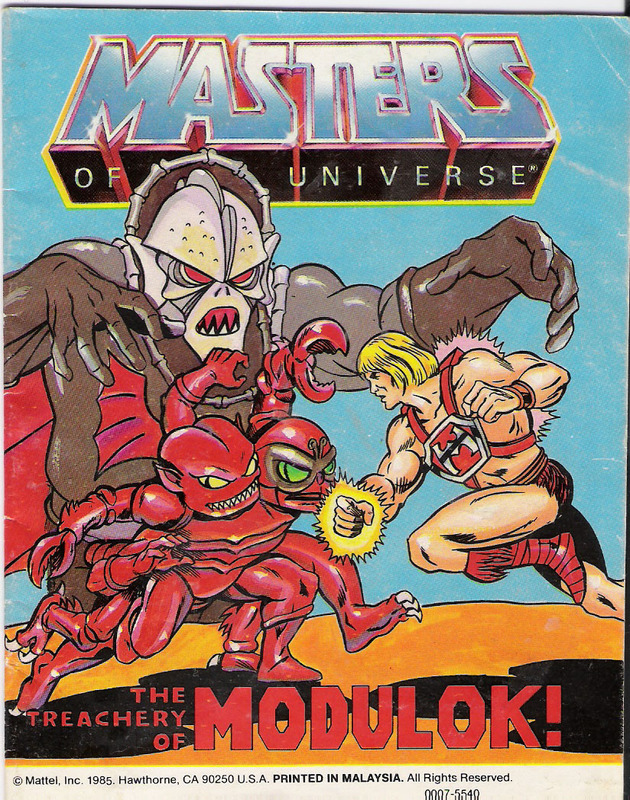 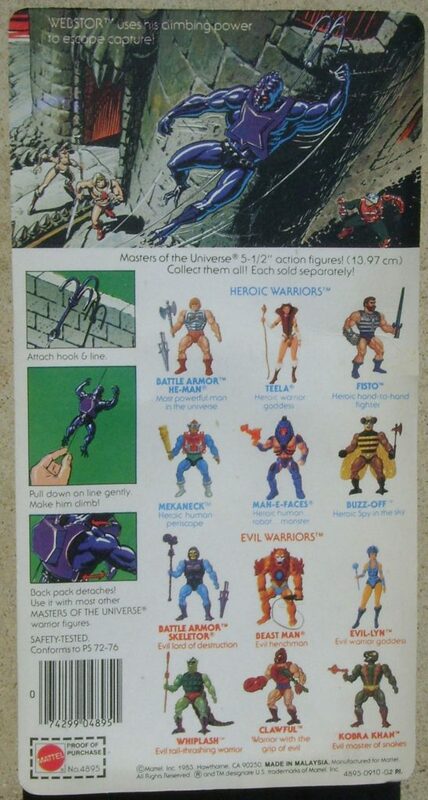 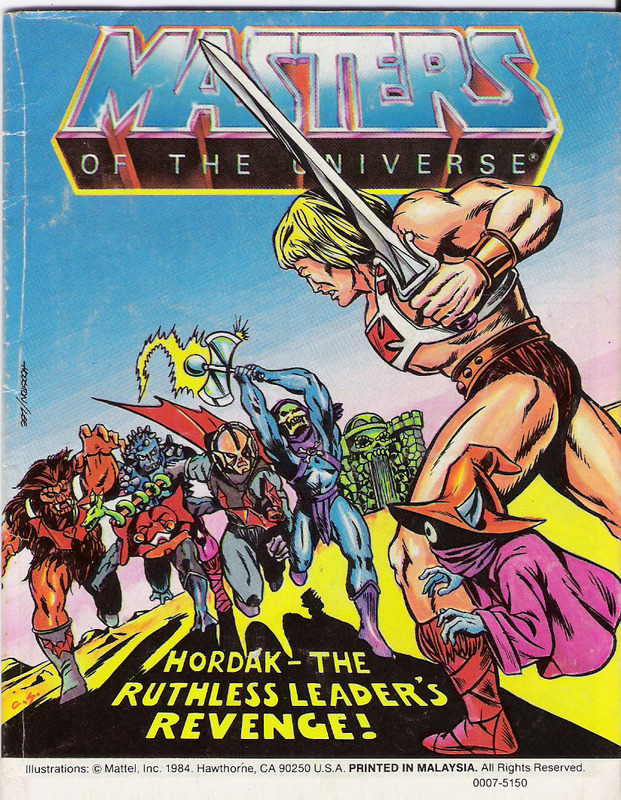 There isn’t one person who knows everything to know about Masters of the Universe, but as a community there is a great deal of knowledge, and it grows over time. 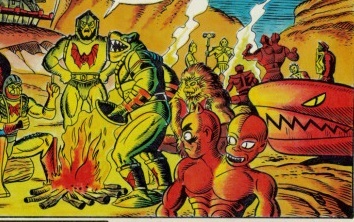 I’d like to acknowledge contributions from the following individuals and groups. 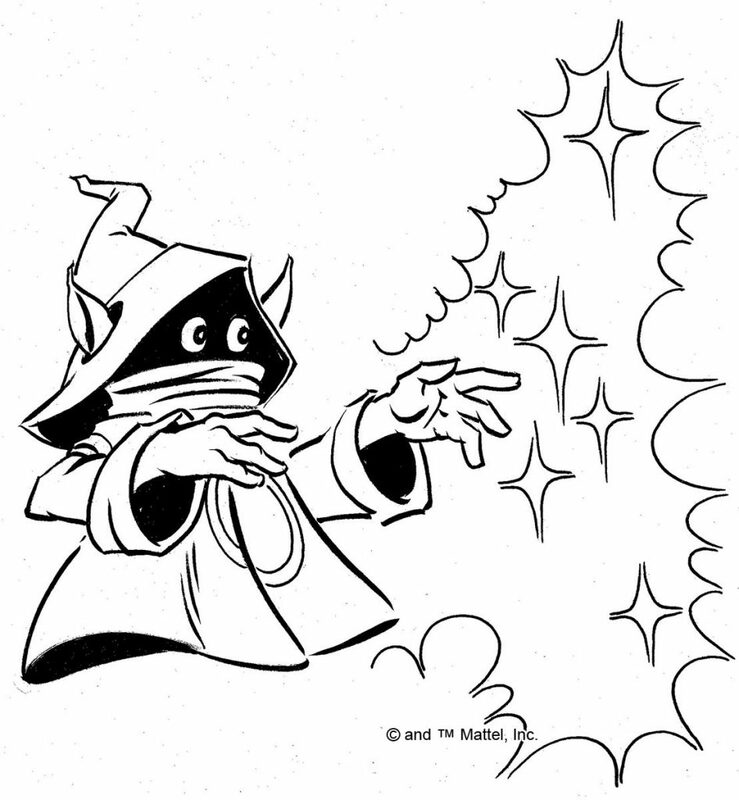 Some of these are direct contributions, which means they directly shared information, images, suggestions, and stories with me. 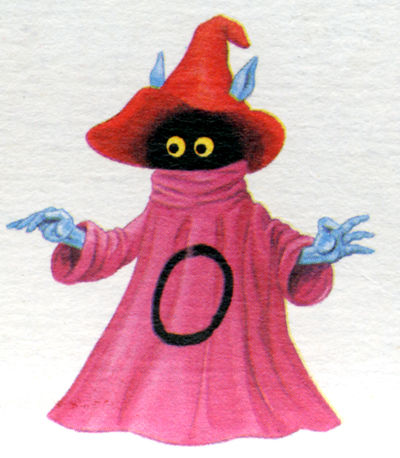 There are others that I haven’t been in contact with directly, but have been sources of knowledge that I have relied upon consistently. 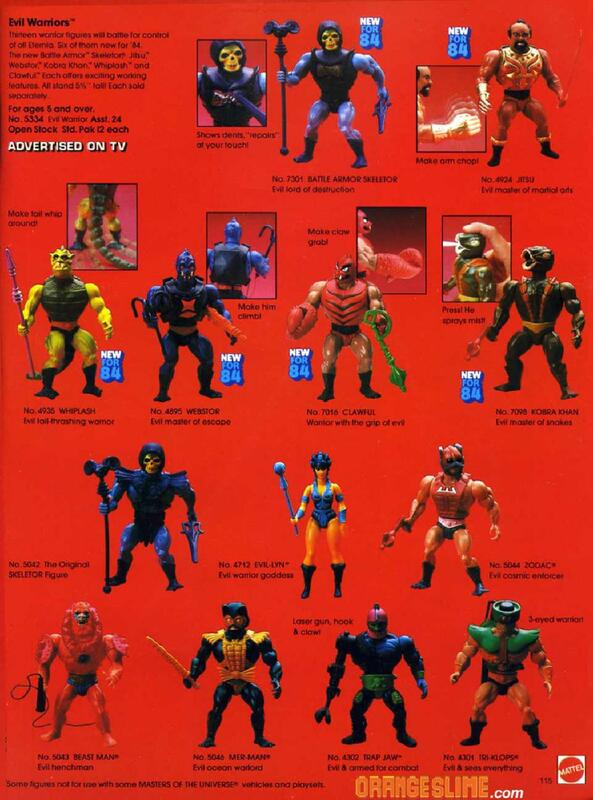 I’m sure I’m forgetting someone, but I’ll continue to add to the list. 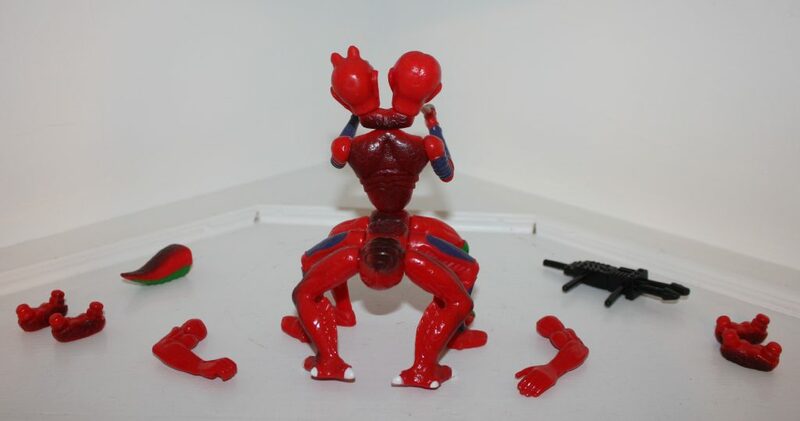 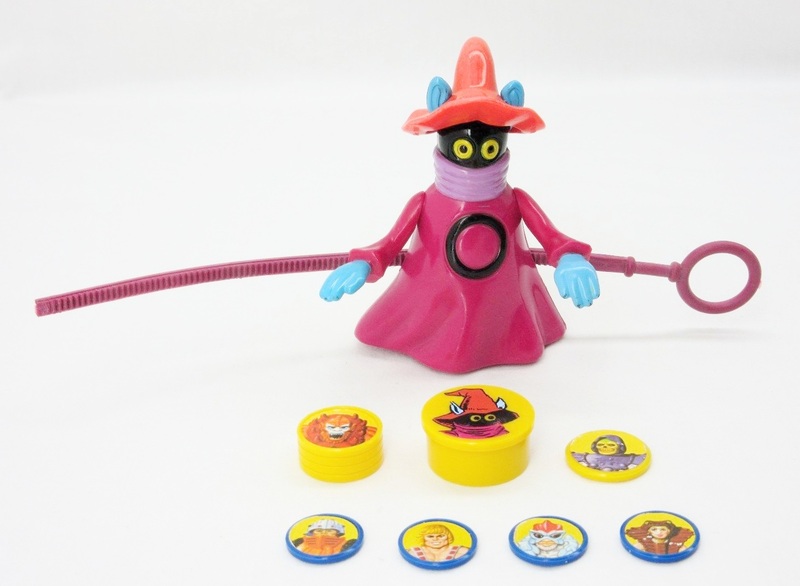 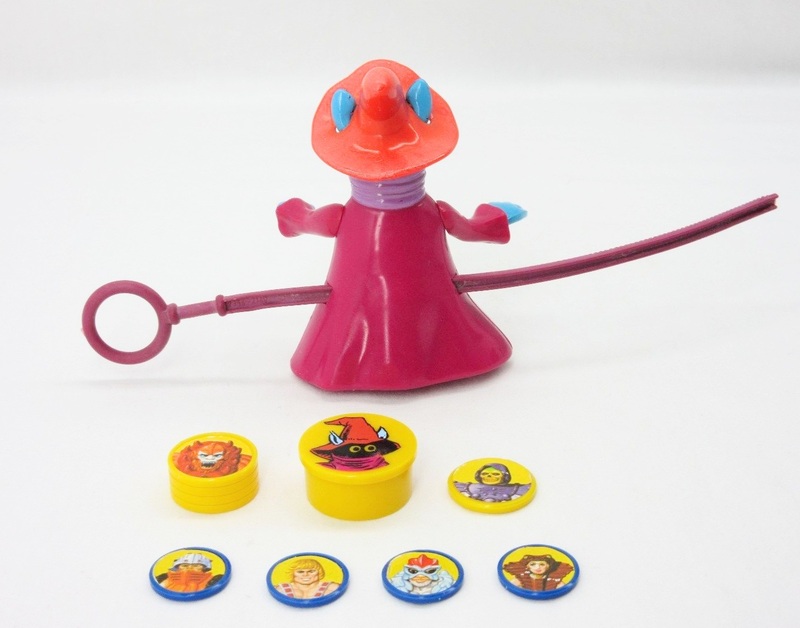 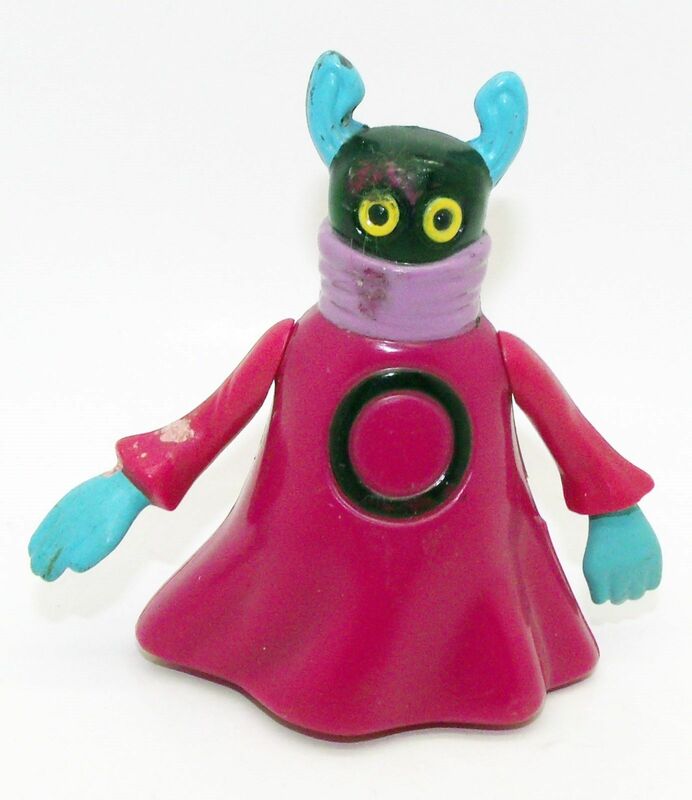 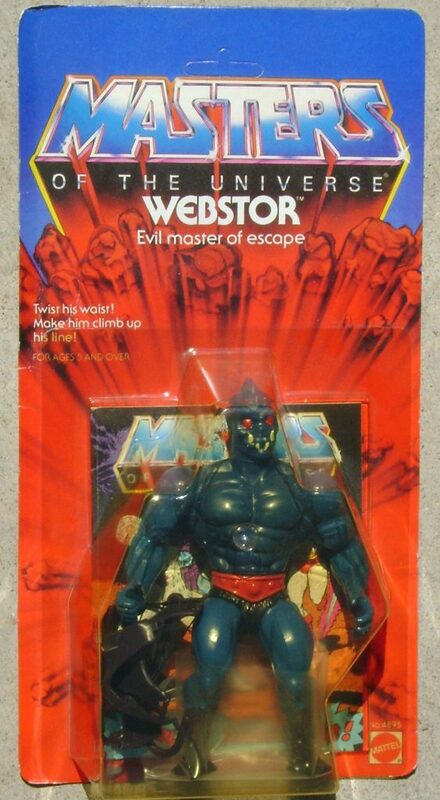 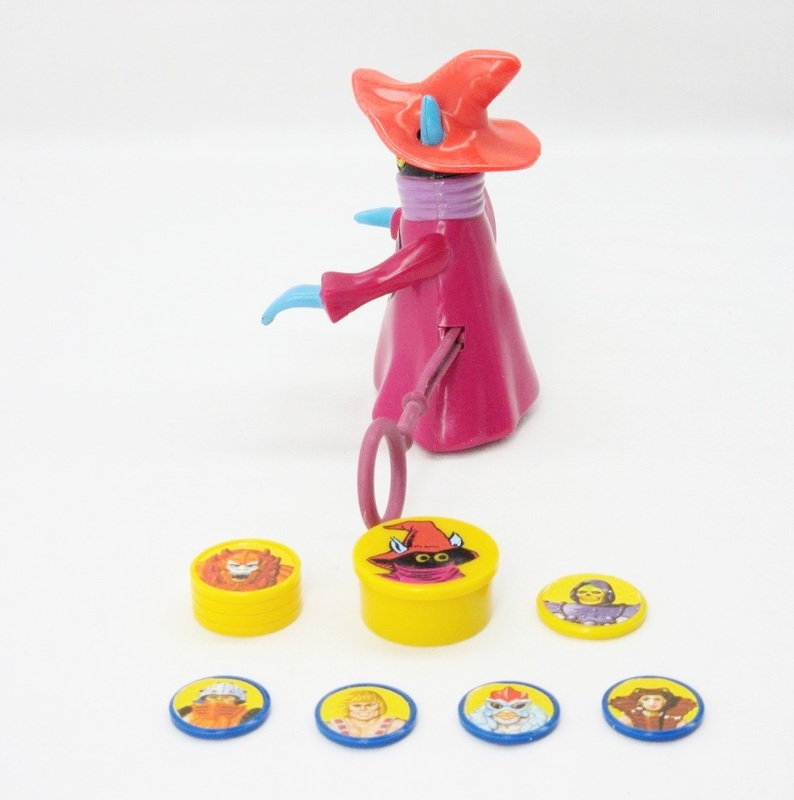 Webstor, not to be confused with 1980s TV character Webster, was a figure I never had as a kid, but always coveted. 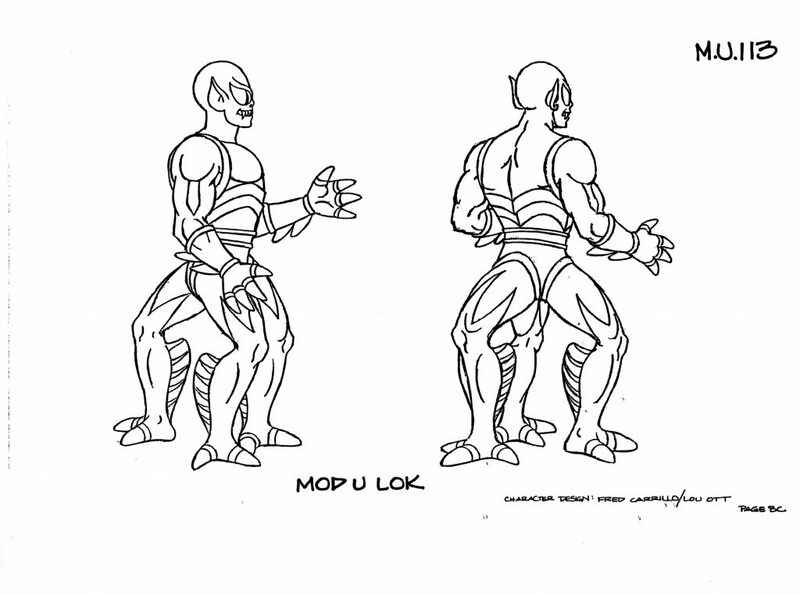 His looks weren’t as striking to me as characters like Clawful or Whiplash, but his action feature was endlessly fascinating. 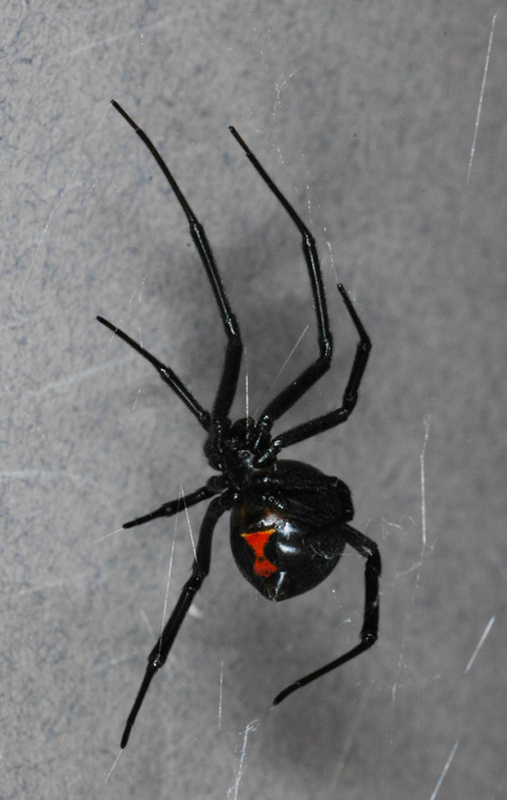 BLACK WIDOW* – as his name suggests, this creepy individual has no scruples whatever. 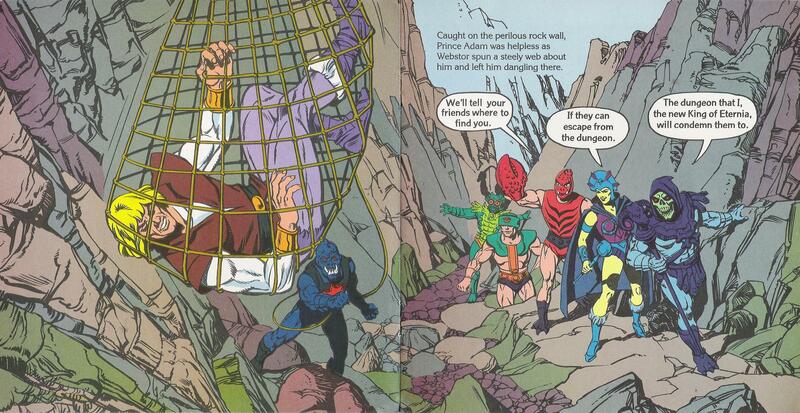 His chief asset is the ability to spin a strong web line in order to climb, snare and imprison those against whom he seeks revenge. 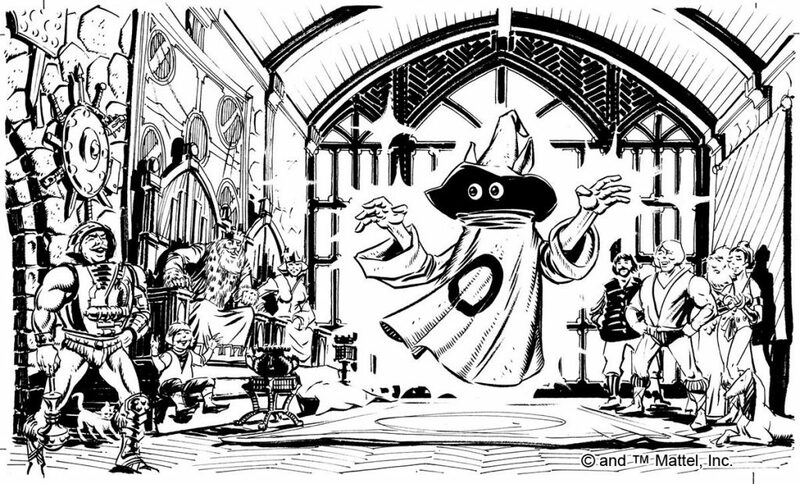 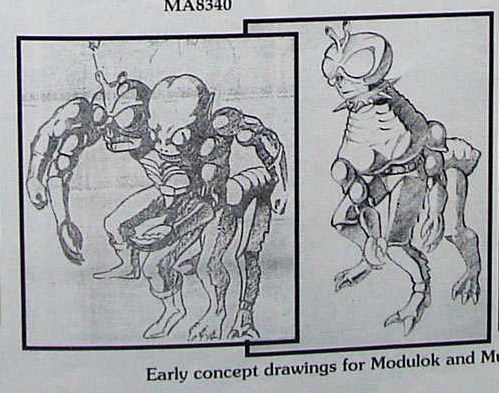 Update: Rebecca Salari Taylor recently shared some early concept art by Mark Taylor. 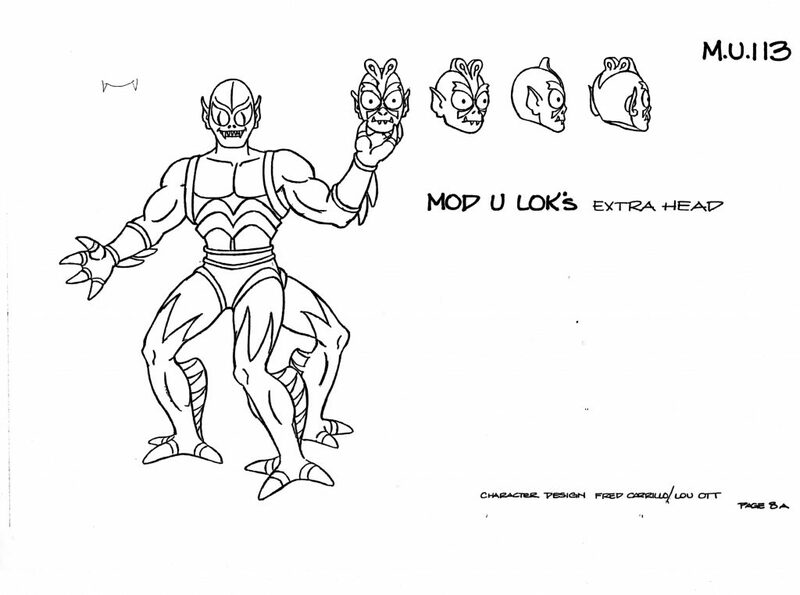 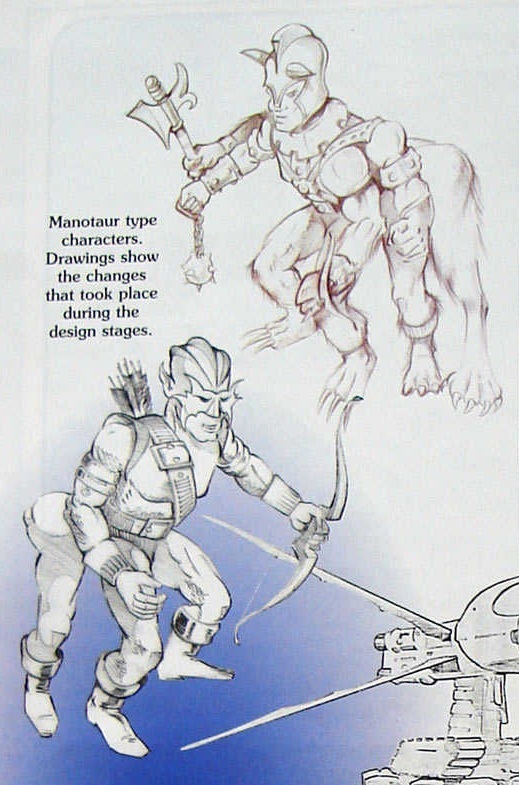 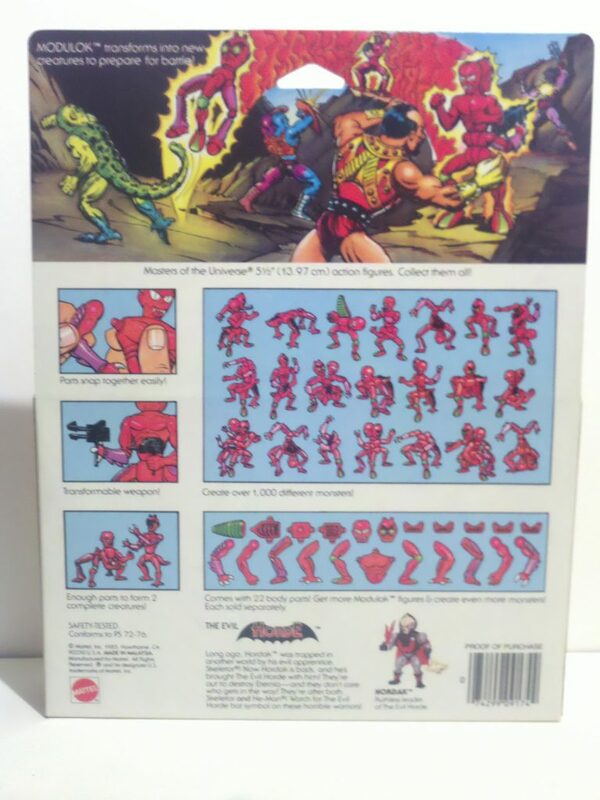 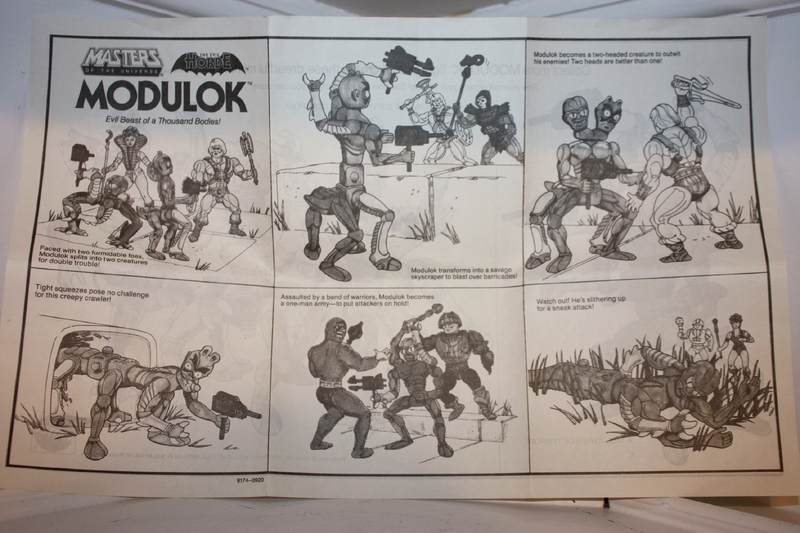 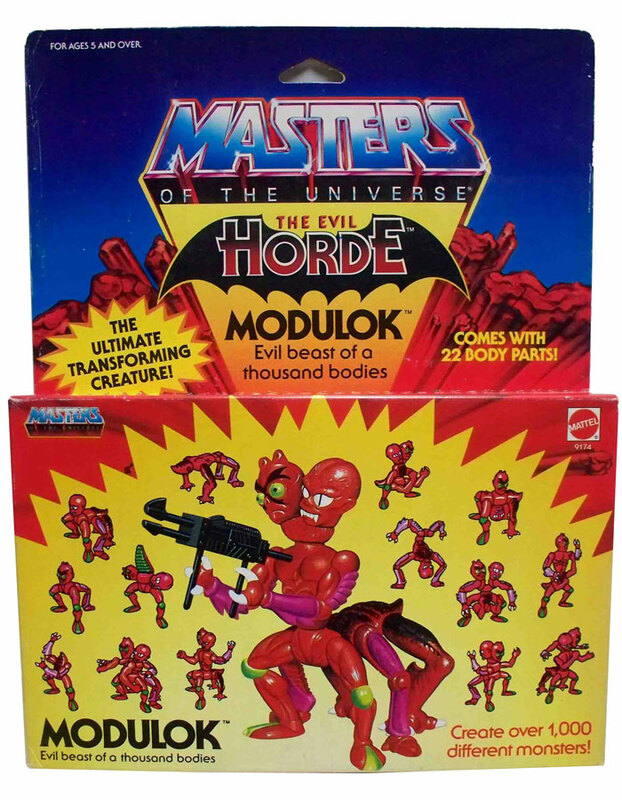 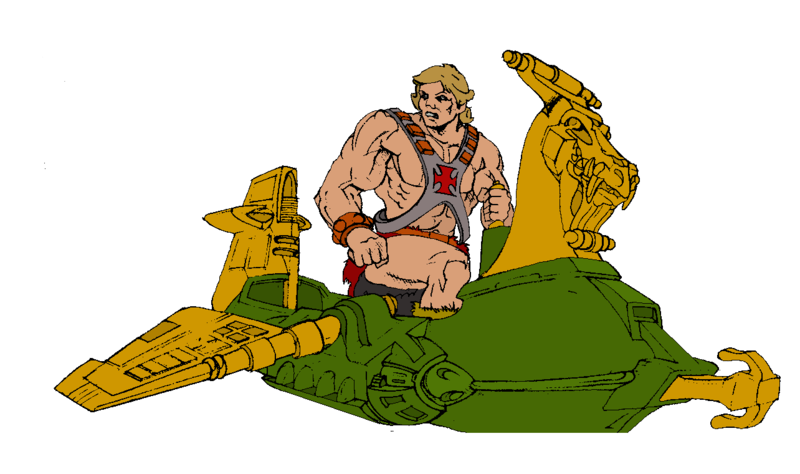 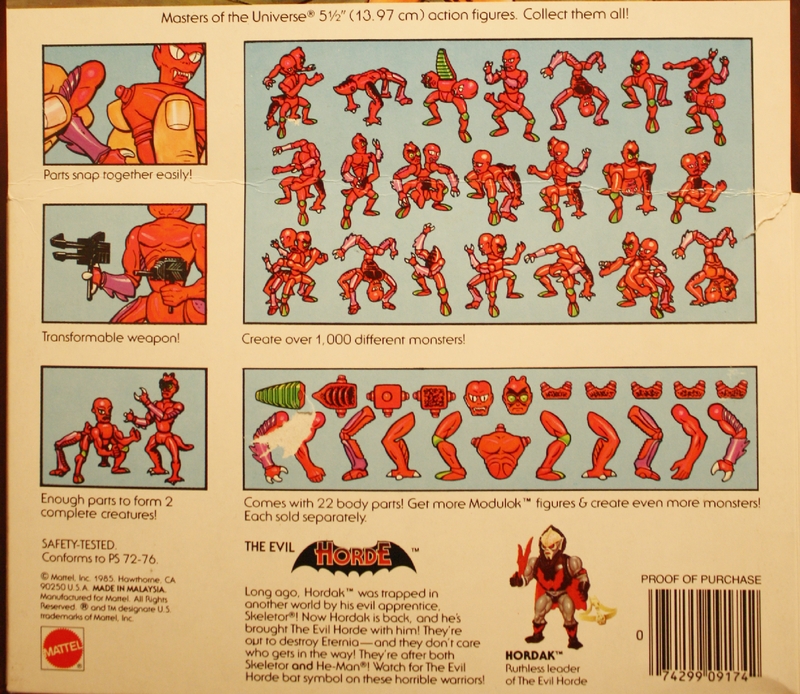 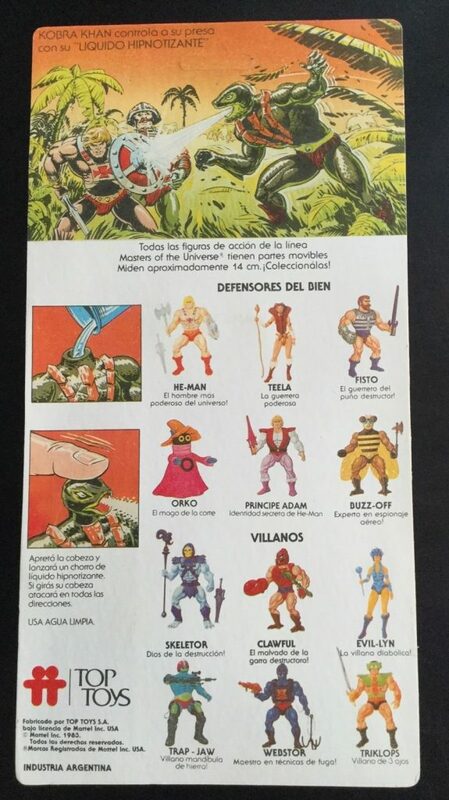 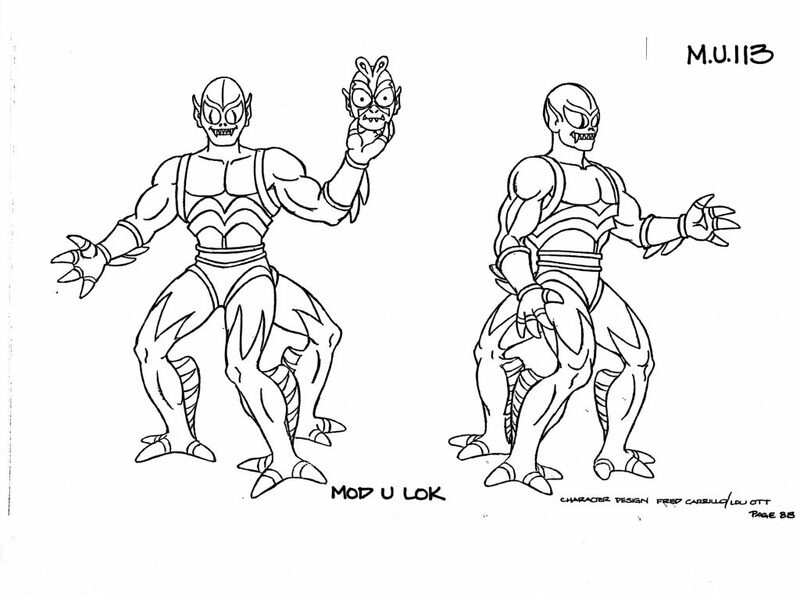 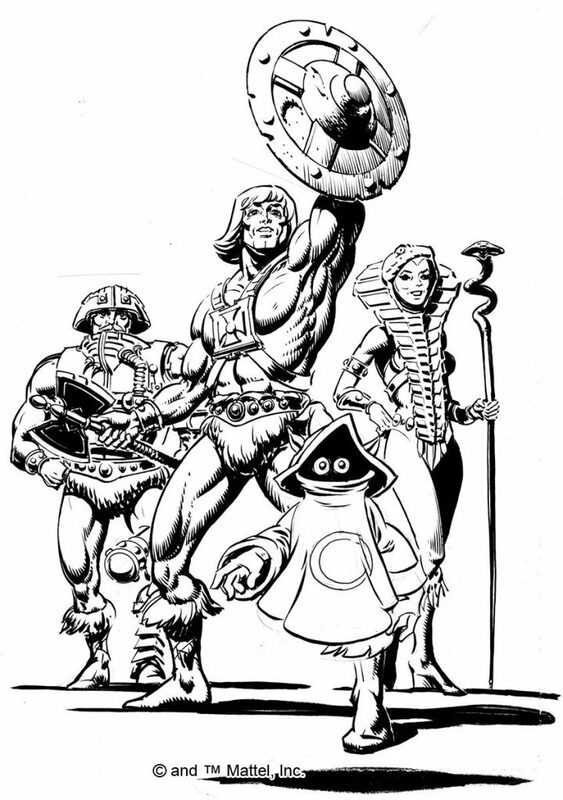 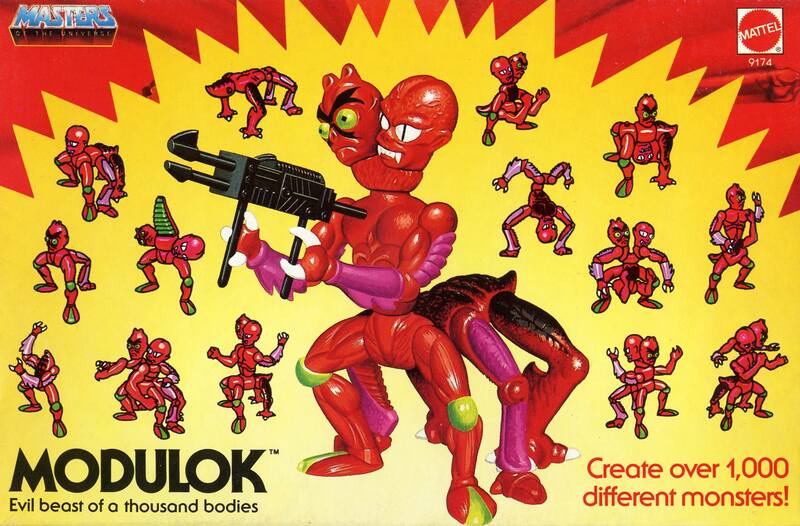 The figure was designed around the time Mark was working on concepts for both He-Man and Conan. 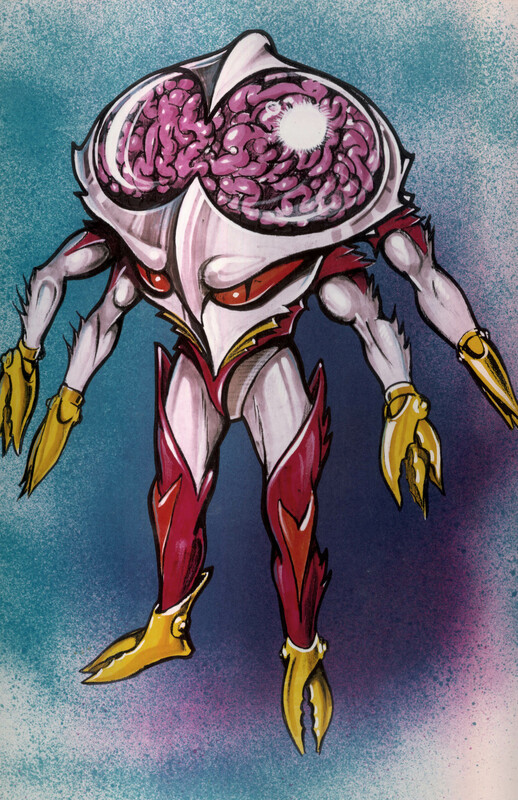 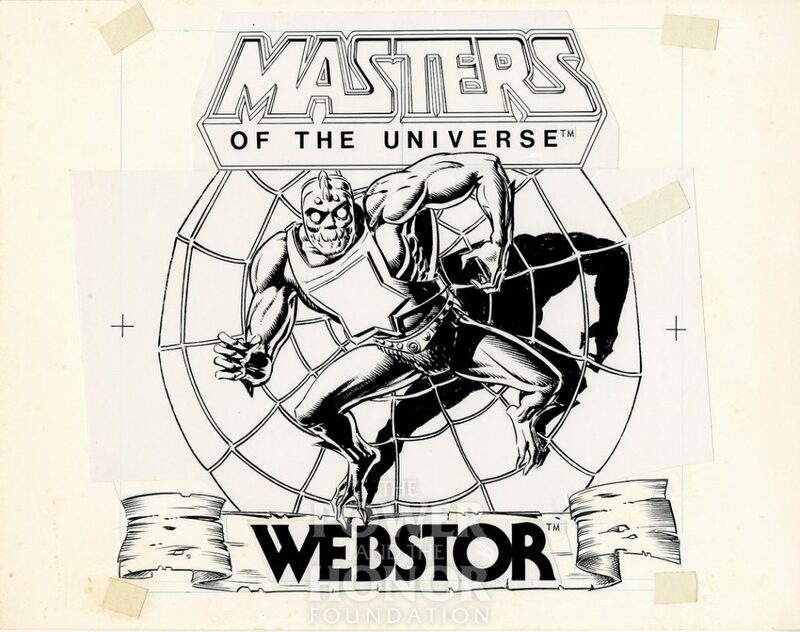 If you look closely at the head/face, all the design details for Webstor are there, minus his additional eyes. 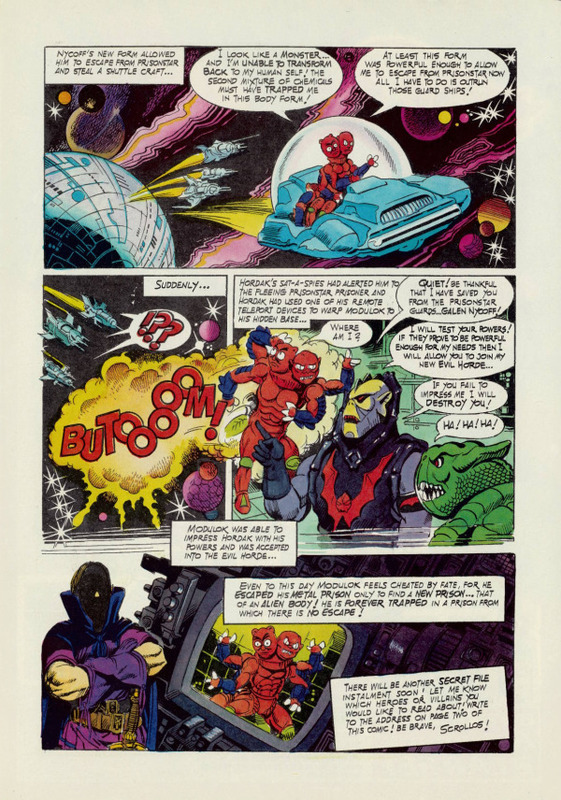 The coloring is, of course, quite different, and this character doesn’t have a spider theme. 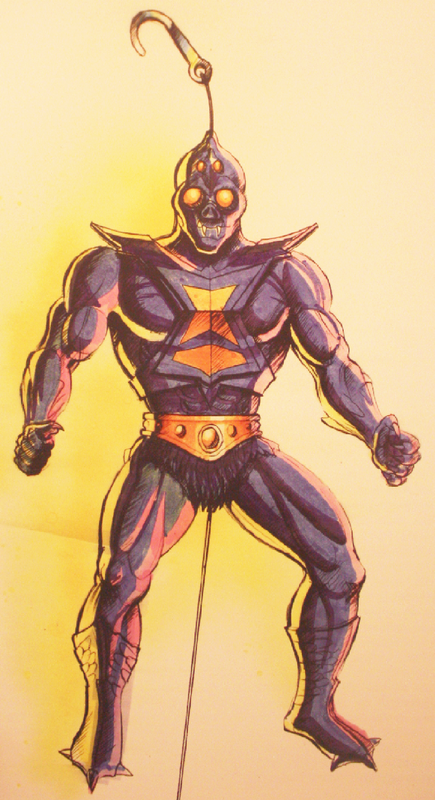 The artwork appears to be undated, but this would have been done early in 1981. 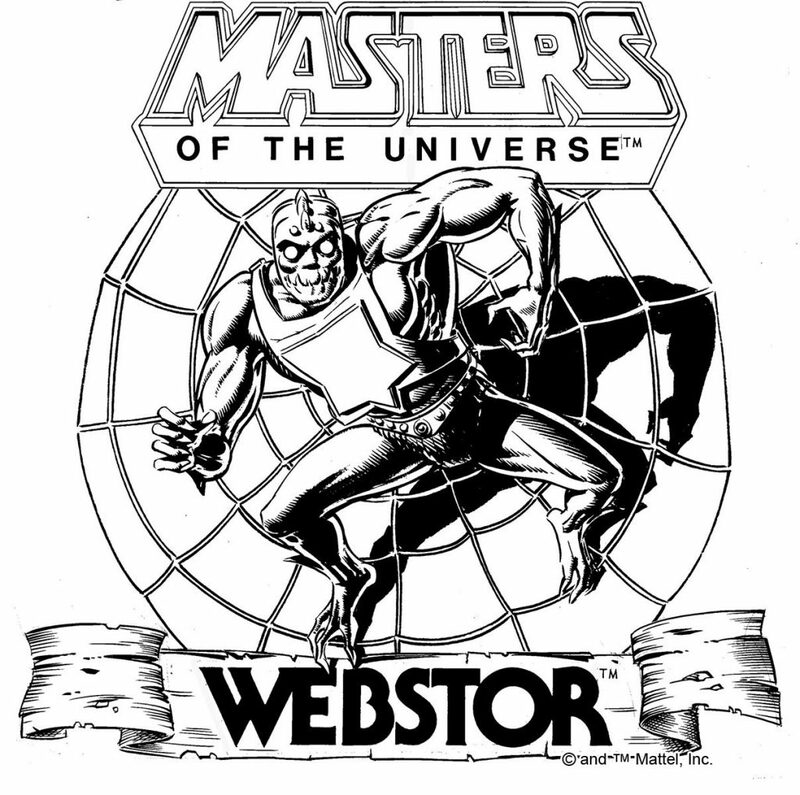 It seems apparent now that Roger Sweet used the face/head from Mark’s drawing, and repurposed it for Webstor. 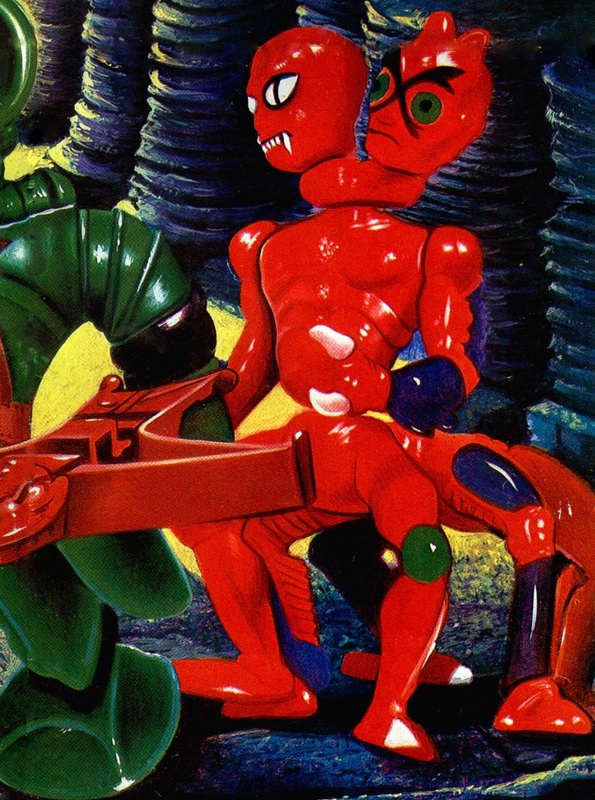 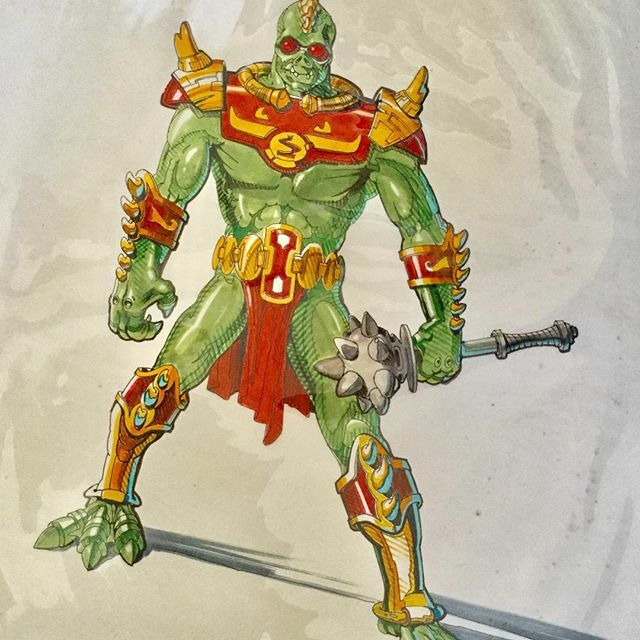 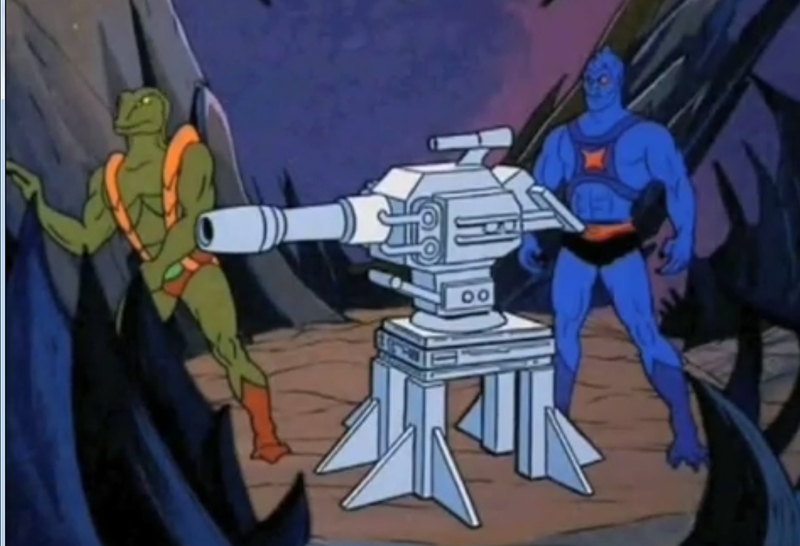 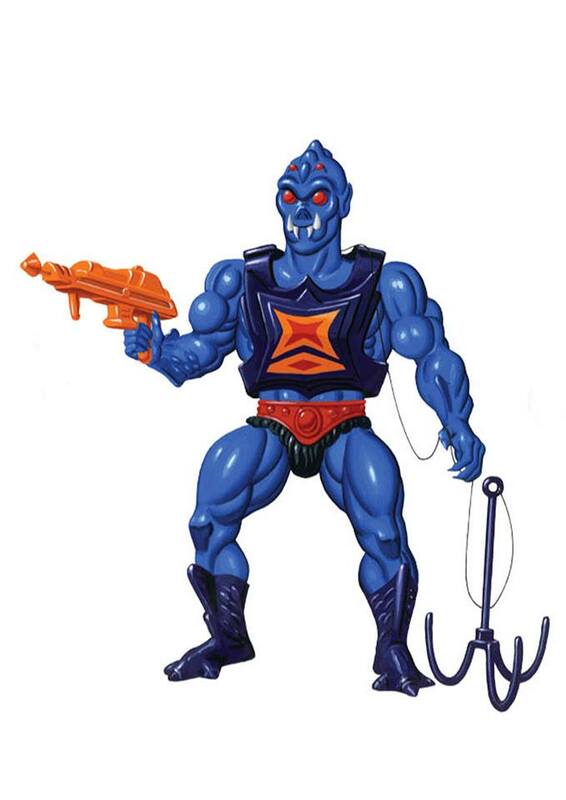 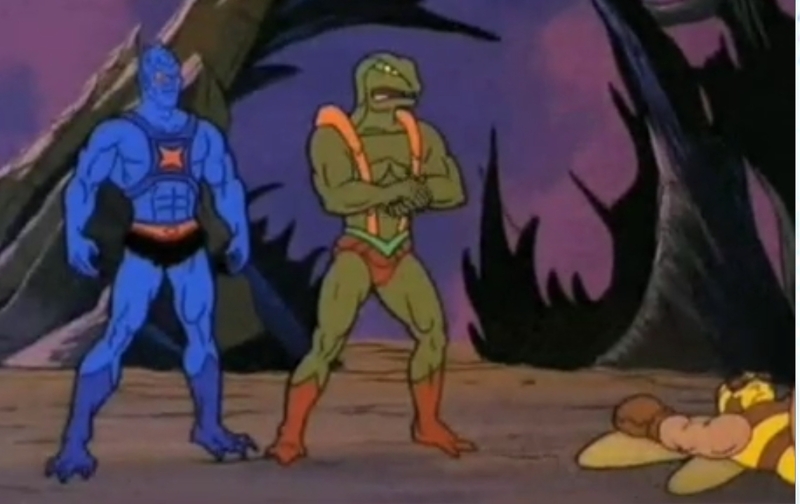 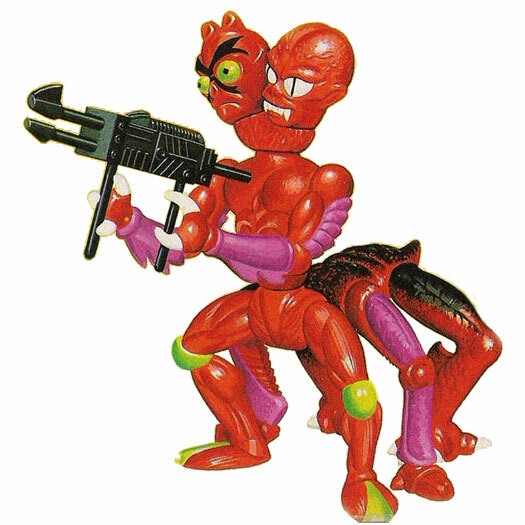 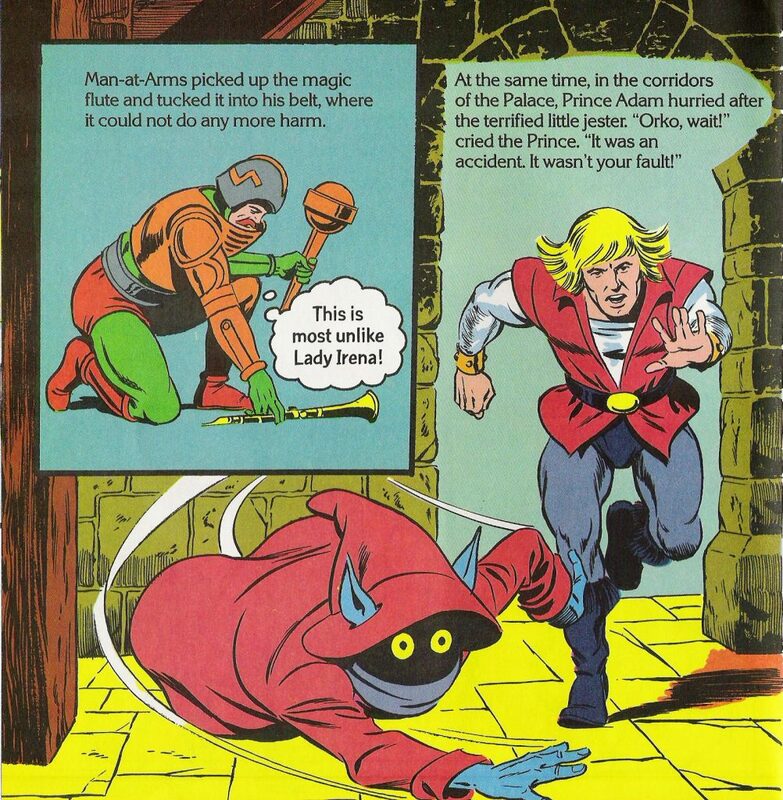 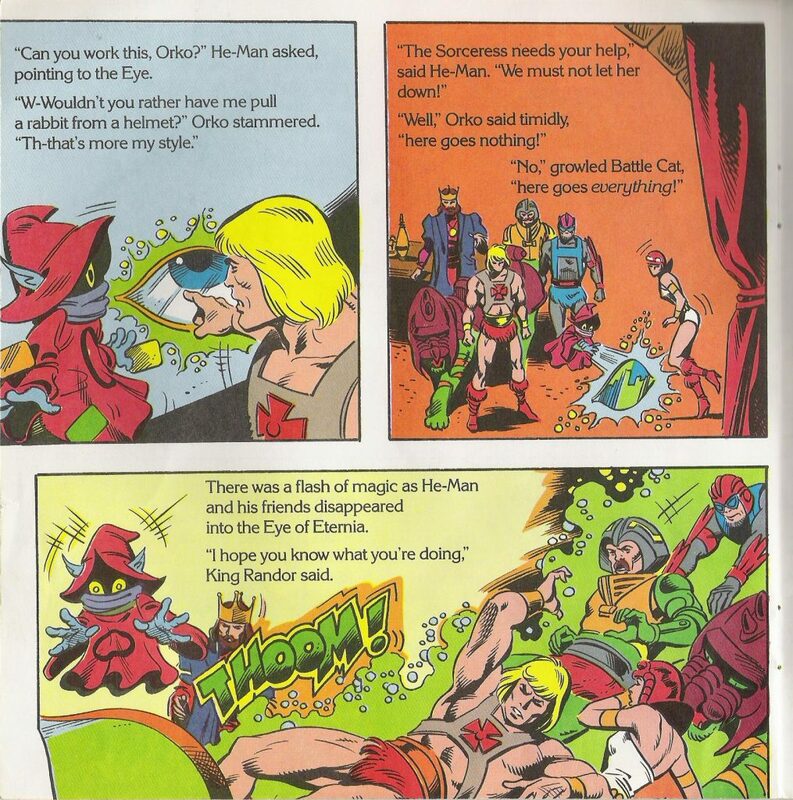 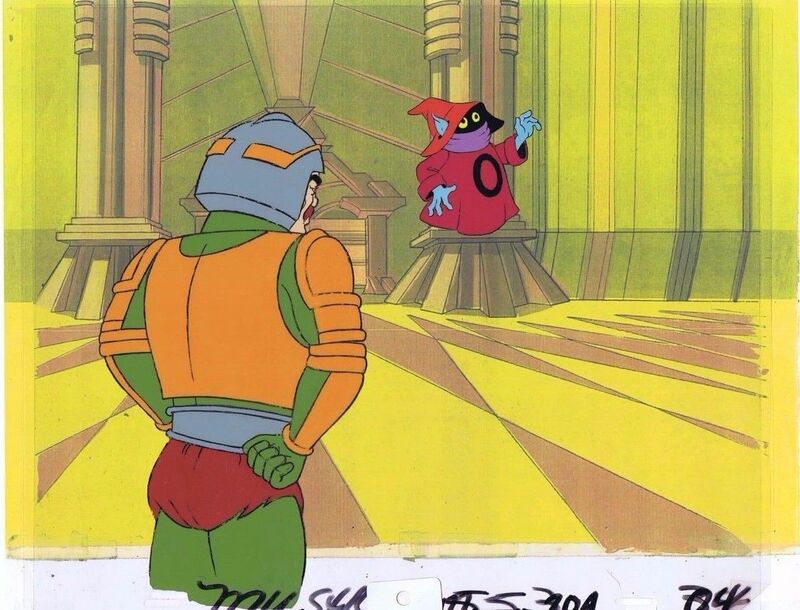 Combining the head from Mark’s green henchman and the body from Mark’s Skeletor design, Roger added new armor and modified the color scheme to help set the character apart. 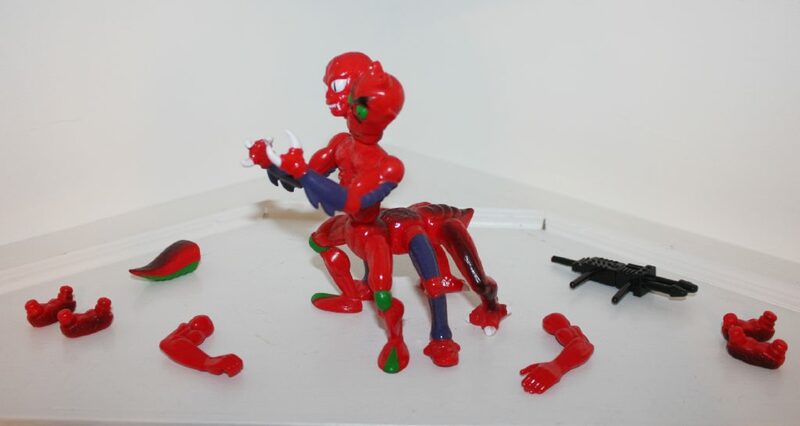 According to The Power and Honor Foundation Catalog, Roger intended for the figure’s differential pulley system to run through the body of the figure itself. 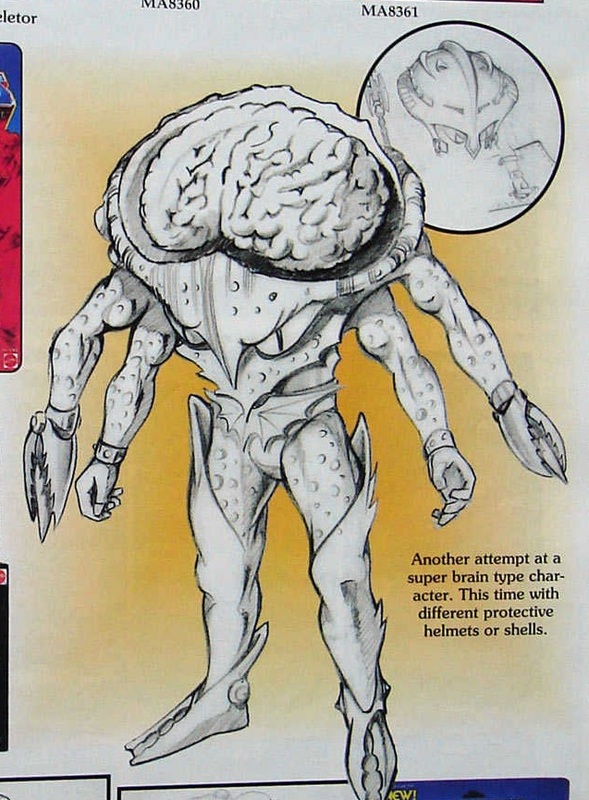 To save costs (and perhaps because a grappling hook from a figure’s head doesn’t make a great deal of sense), engineers moved the mechanism to the back of Webstor’s armor. 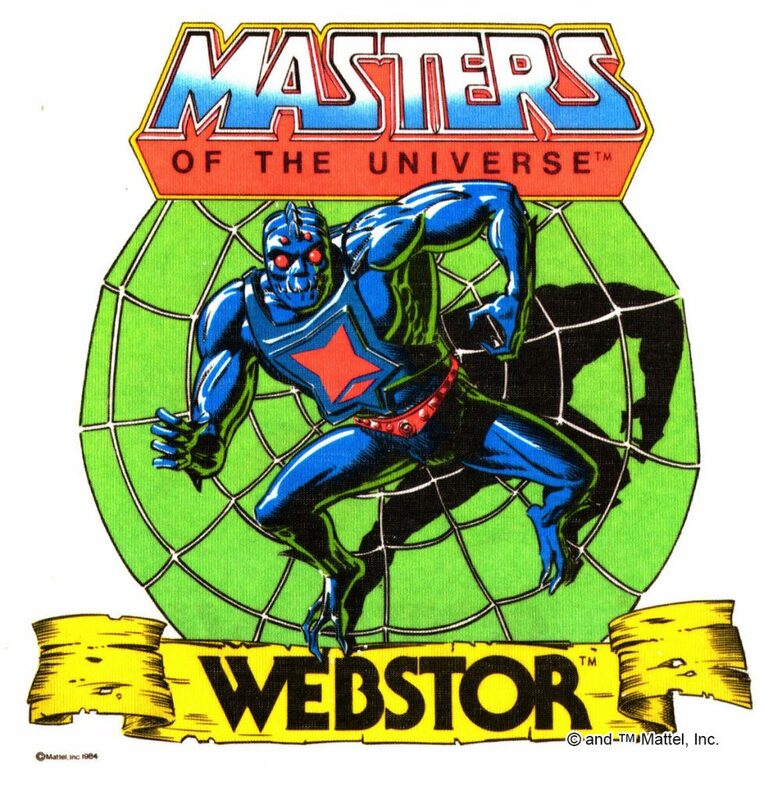 Webstor doesn’t look particularly spider-like to me, other than the fact that he has four eyes and a black widow marking on his armor. 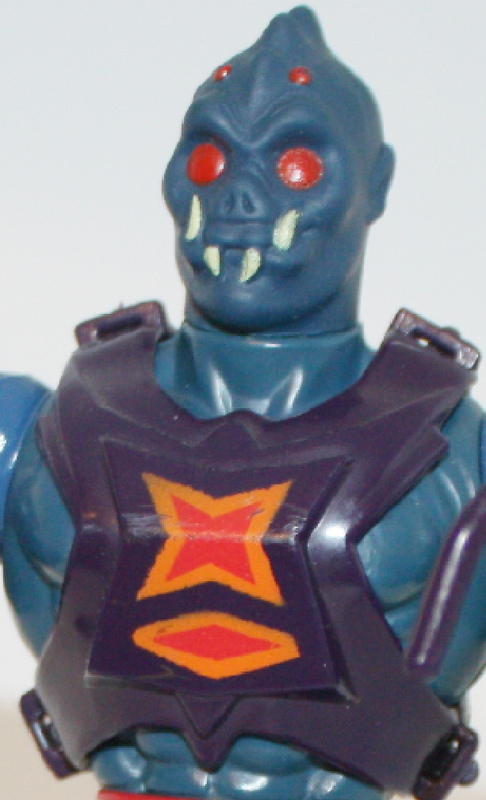 Aside from those details, he could pass for some kind of blue orc. 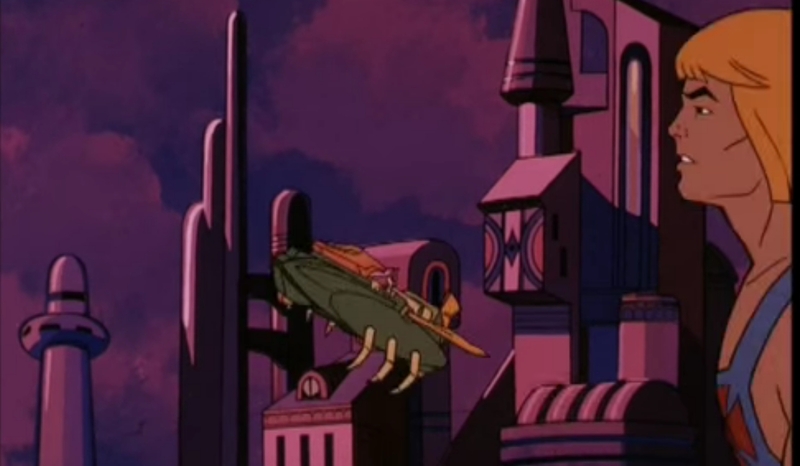 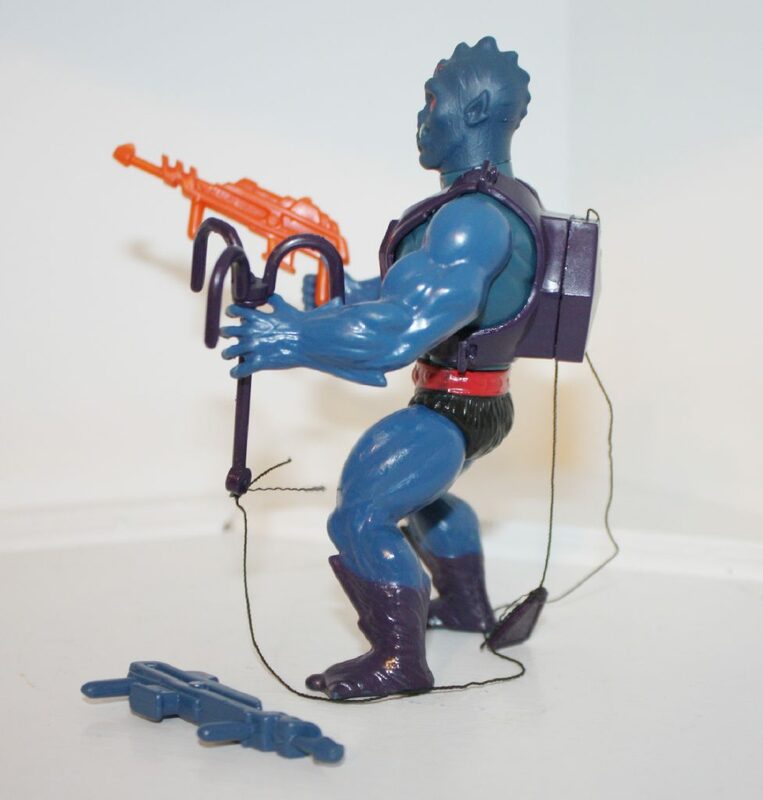 Aside from the reused grappling hook, Webstor was also given another recycled accessory – the rifle from the Castle Grayskull weapons rack. 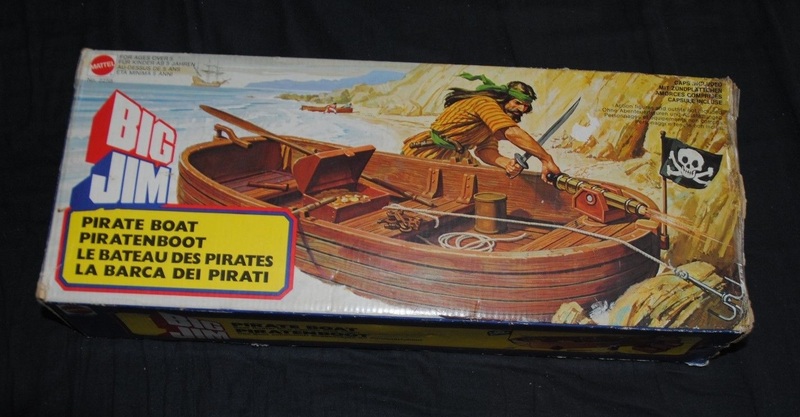 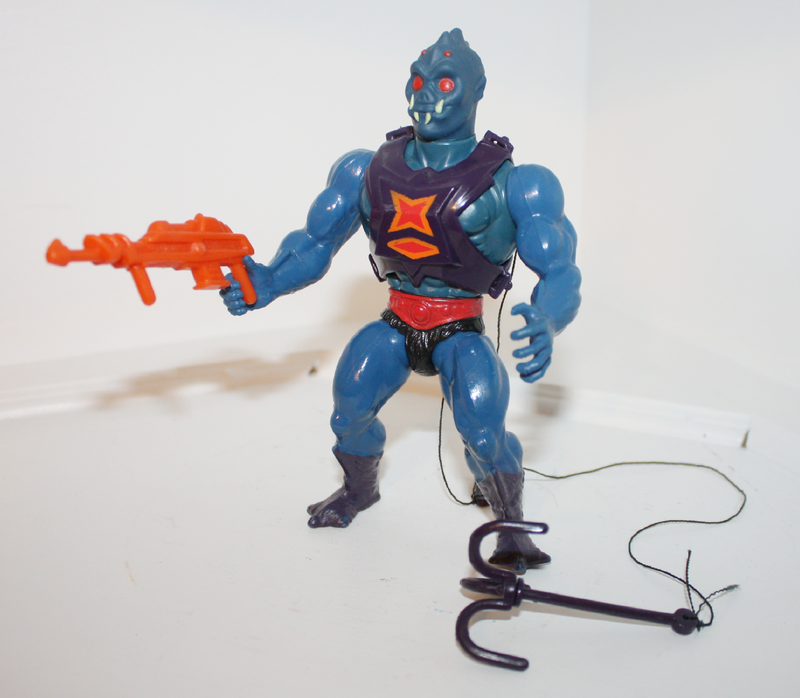 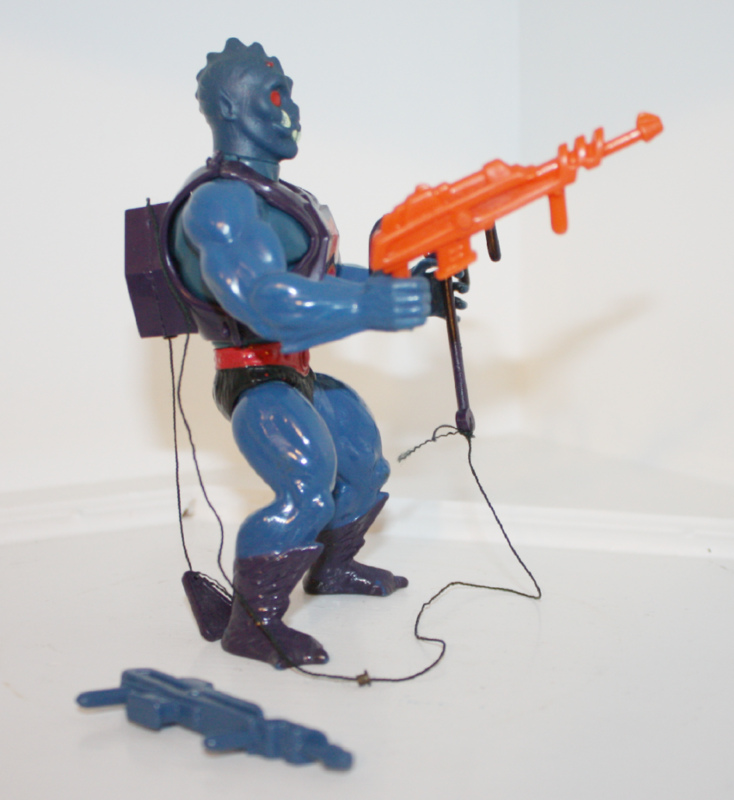 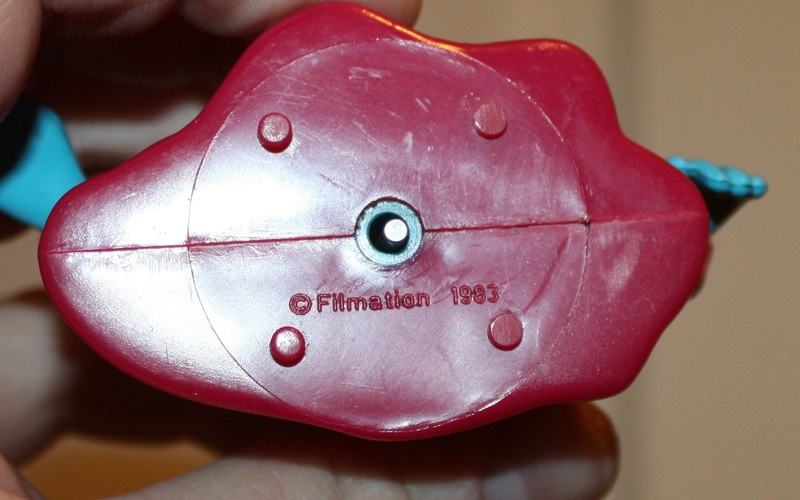 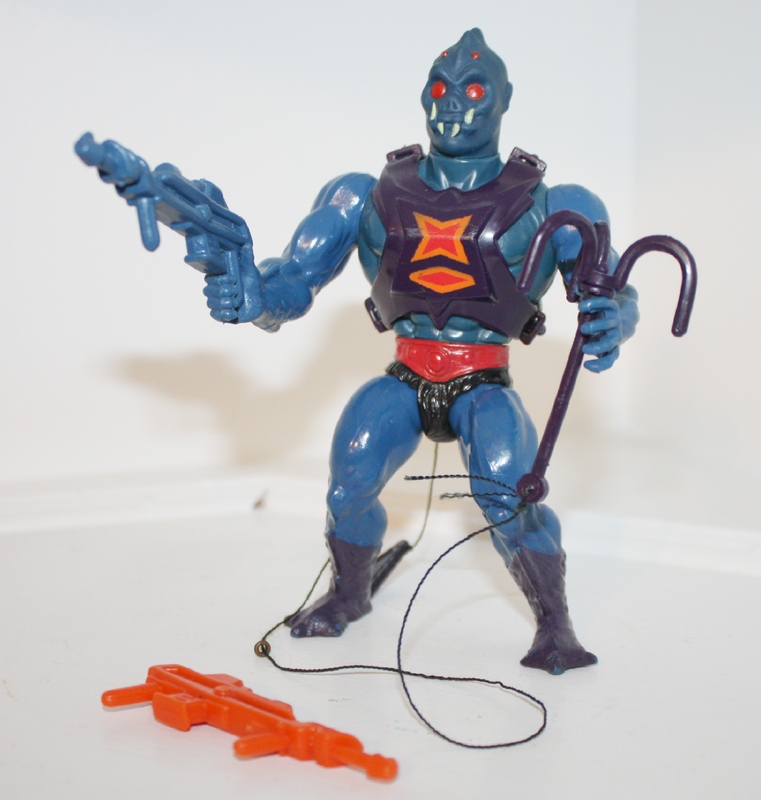 In most cases this was molded in orange plastic, but some rare examples came with a blue rifle. 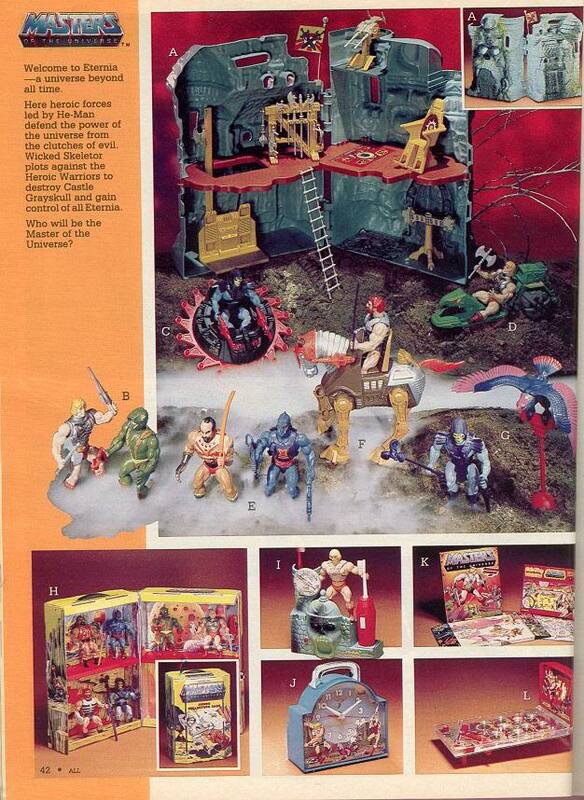 Both versions appear in early catalog photos as well. 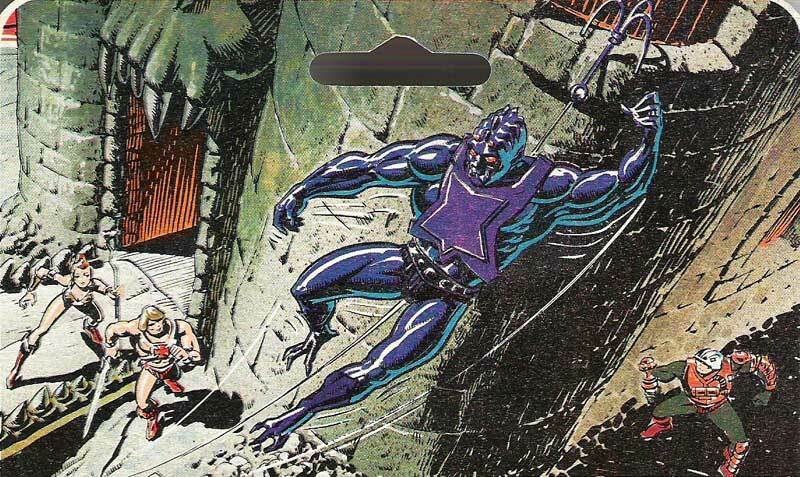 Webstor’s action feature allowed him to “climb” his own string when you pulled it from the bottom. 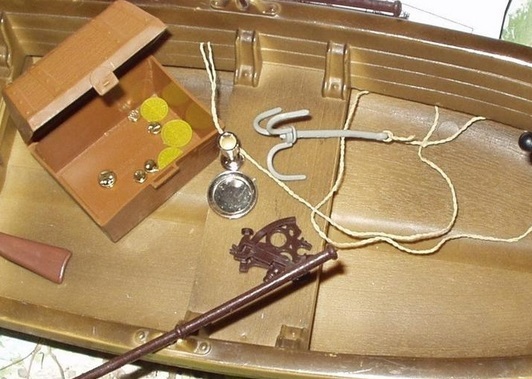 Due to the complexity of the internal pulley system, it is pretty common to find examples where the string has gotten tangled internally. 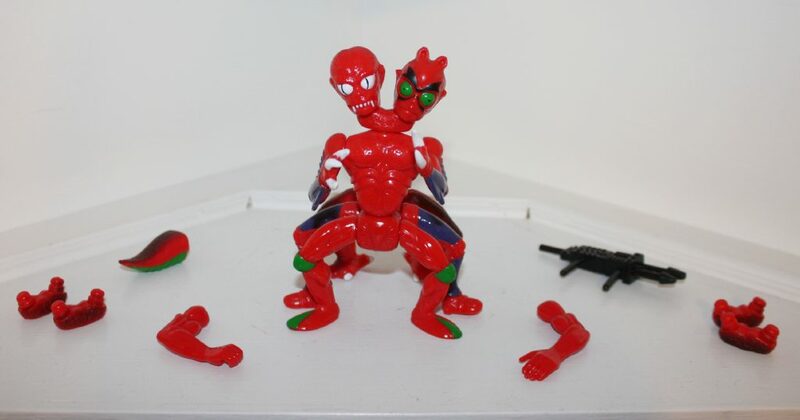 That was the case with my figure, but I was able to get mine working again using He-Bro’s method. 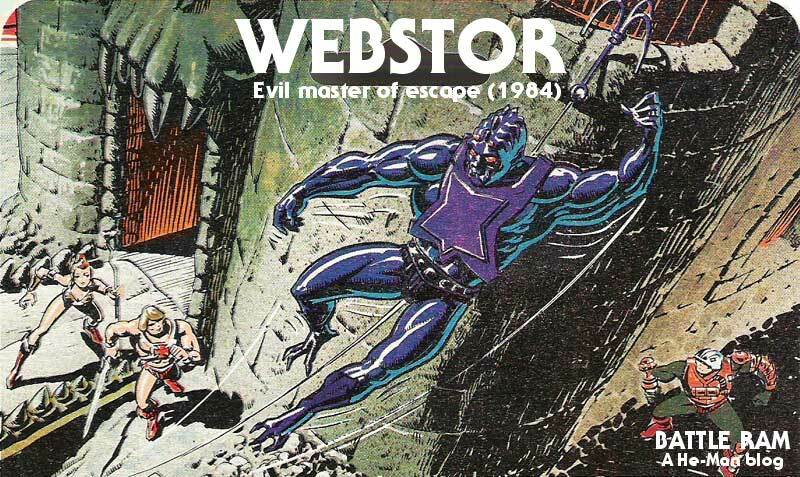 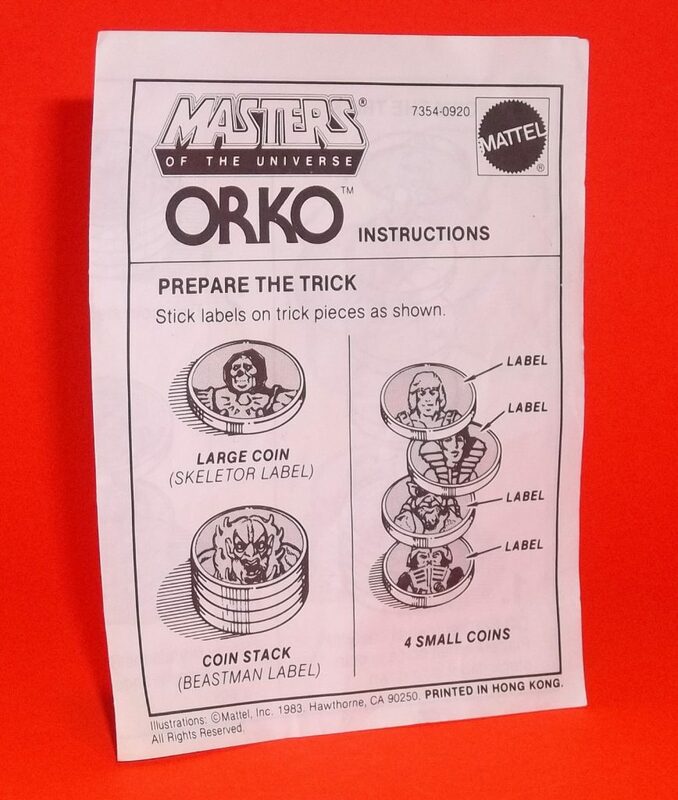 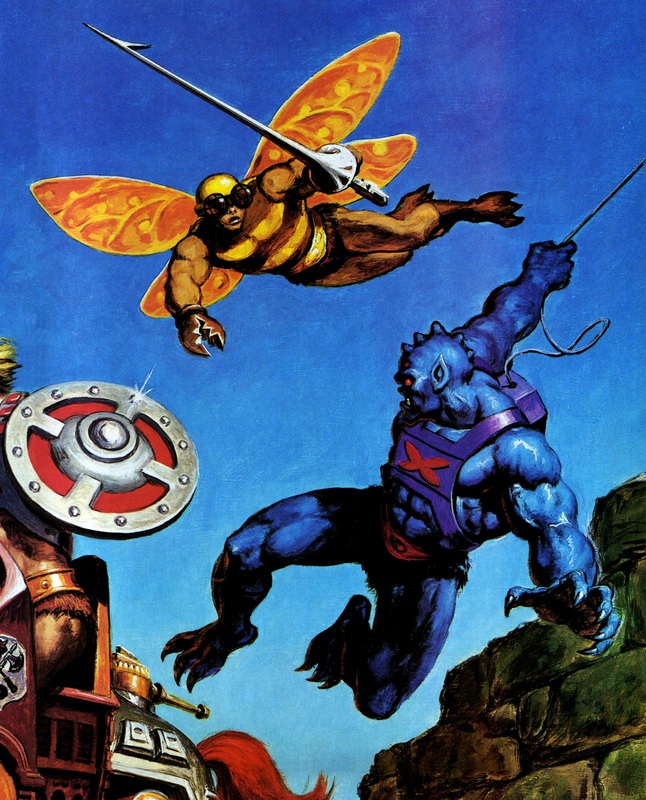 The scene on the back of Webstor’s card was illustrated by Errol McCarthy, who for some reason omitted the black widow symbol on Webstor’s chest. 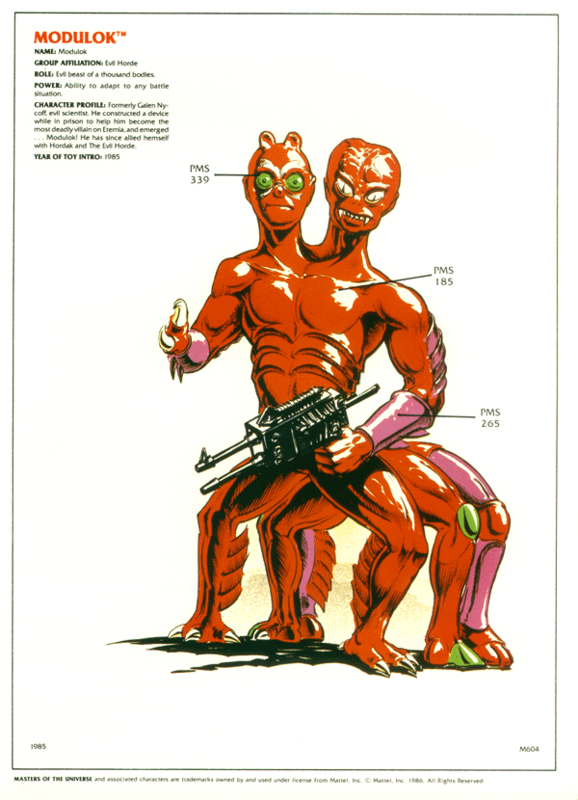 Errol would go on to portray the character in several other illustrations for use by licensees, as well as in the 1987 Style Guide. 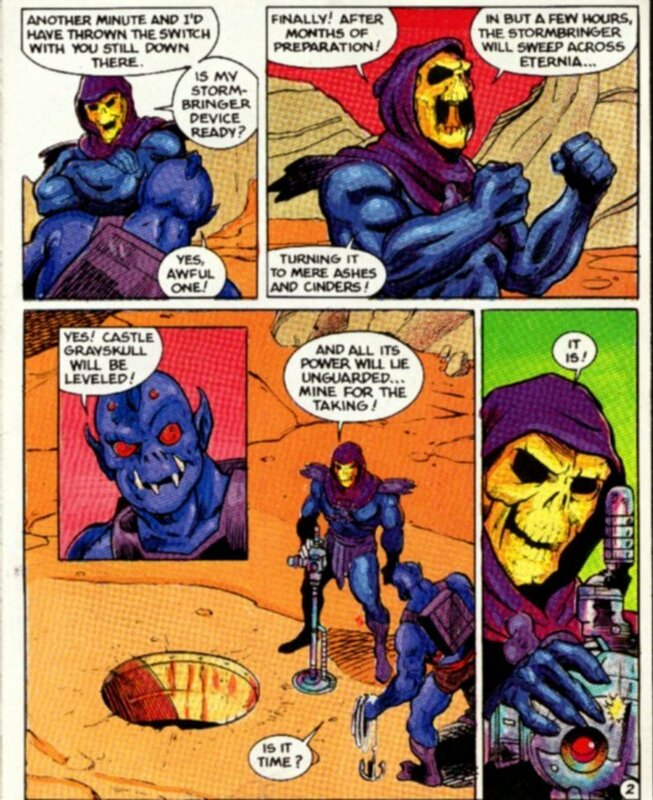 This beast is inordinately strong, and is closely allied with Skeletor. 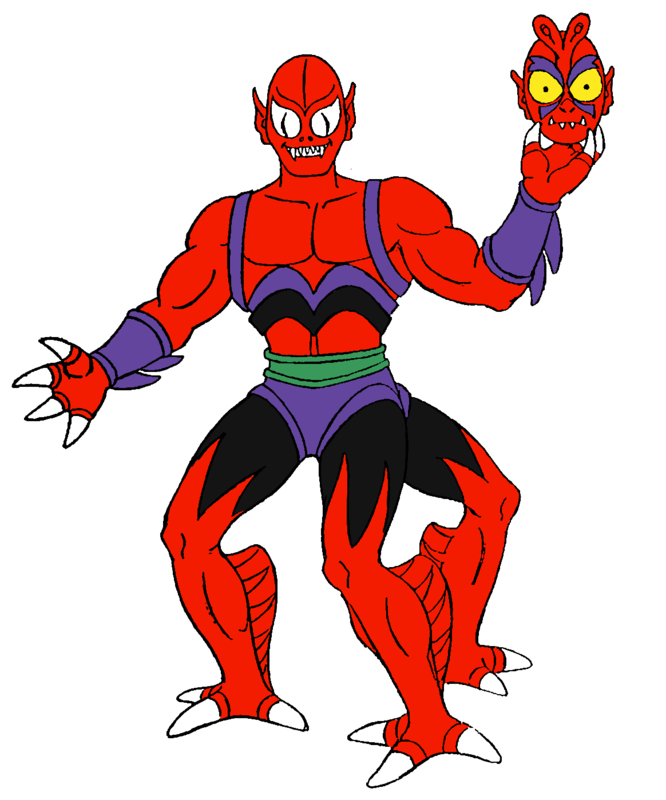 He is probably one of the cleverest Evil Warriors outside of Skeletor, and that is how he gained the evil leader’s trust. 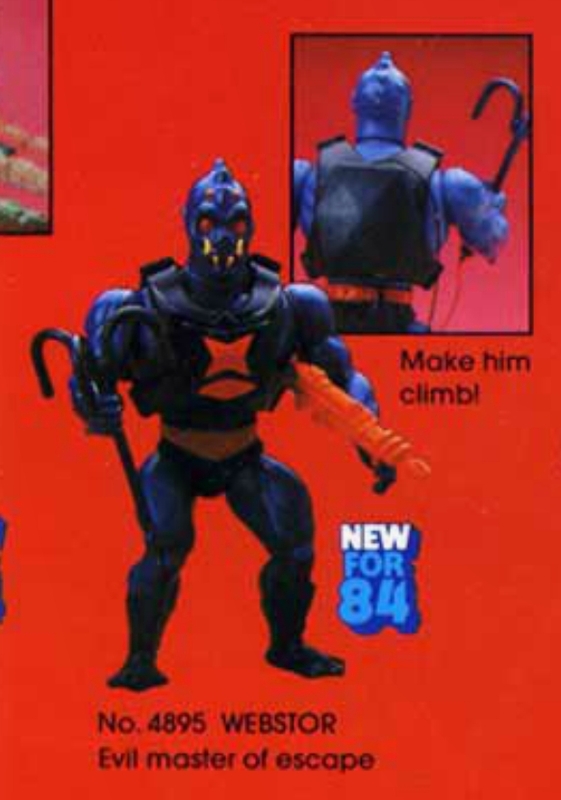 His hook and winch allow him to climb and crawl in spaces where other warriors couldn’t go. 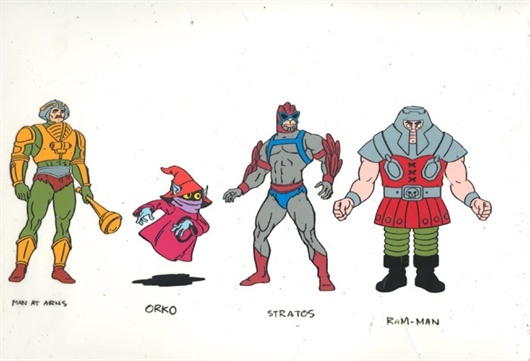 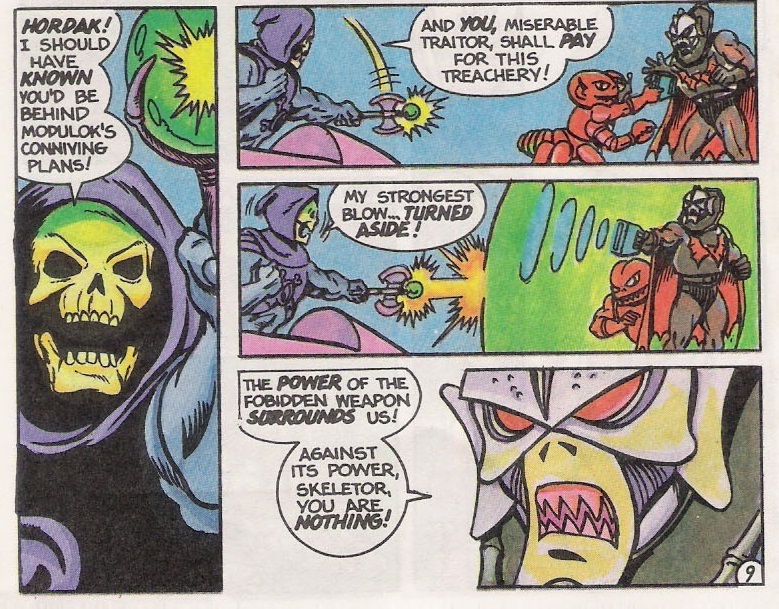 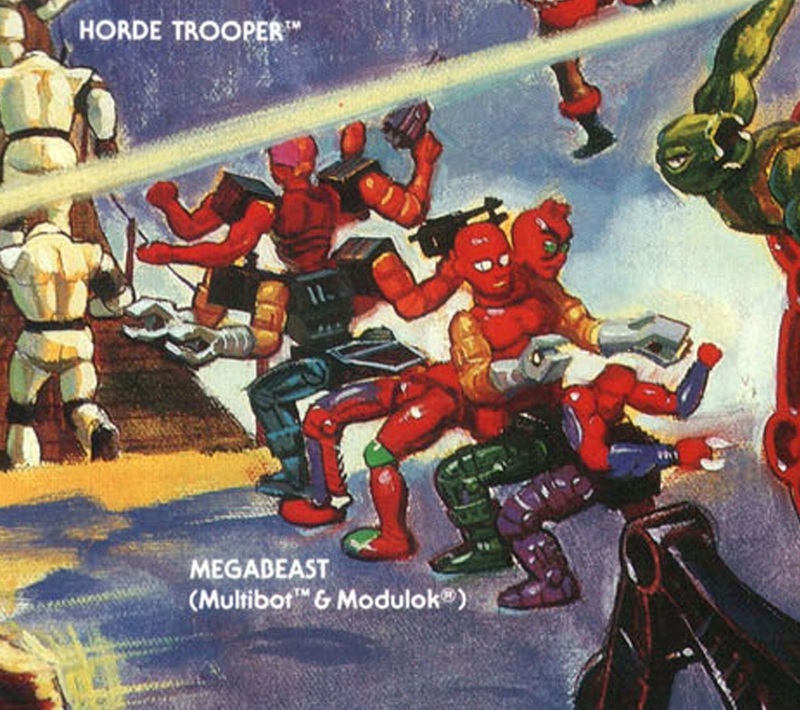 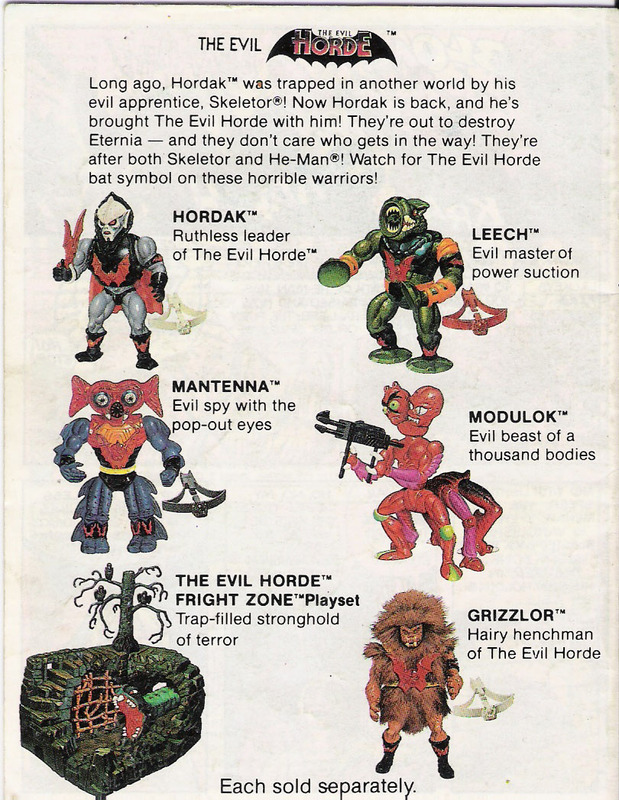 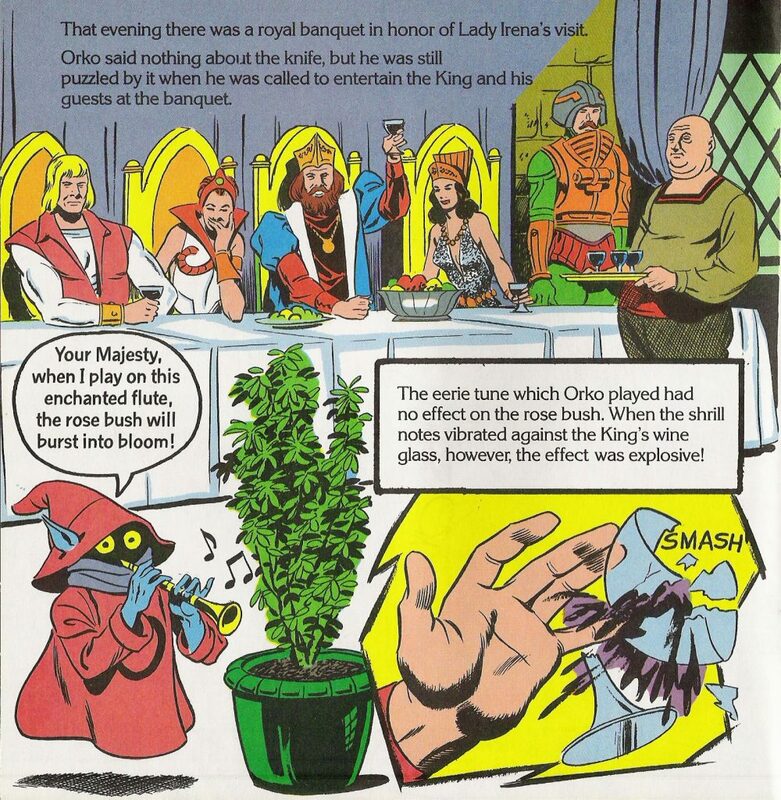 Webstor first appears in the excellent Clash of Arms mini comic, alongside a cavalcade of villains like Clawful, Whiplash, and Jitsu. 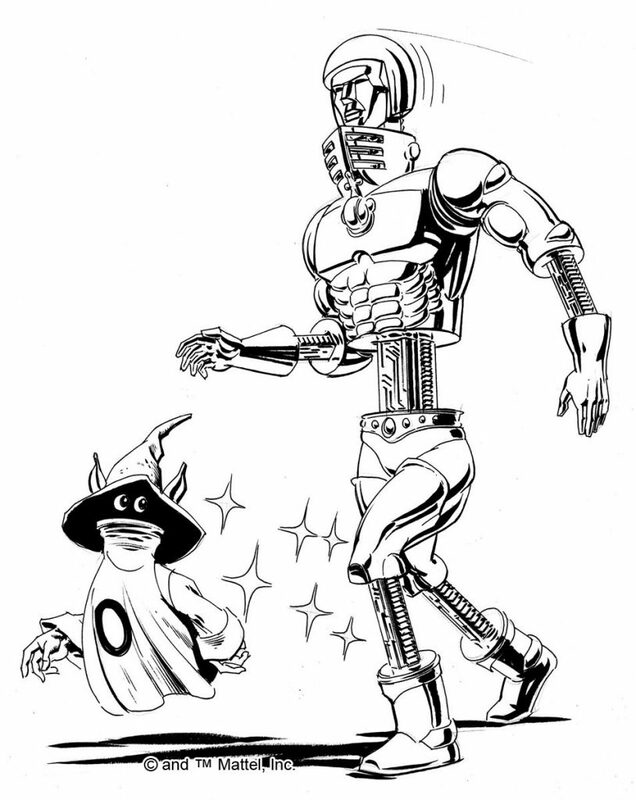 However, Webstor is taken out of the fight early with a vicious kick from Stridor. 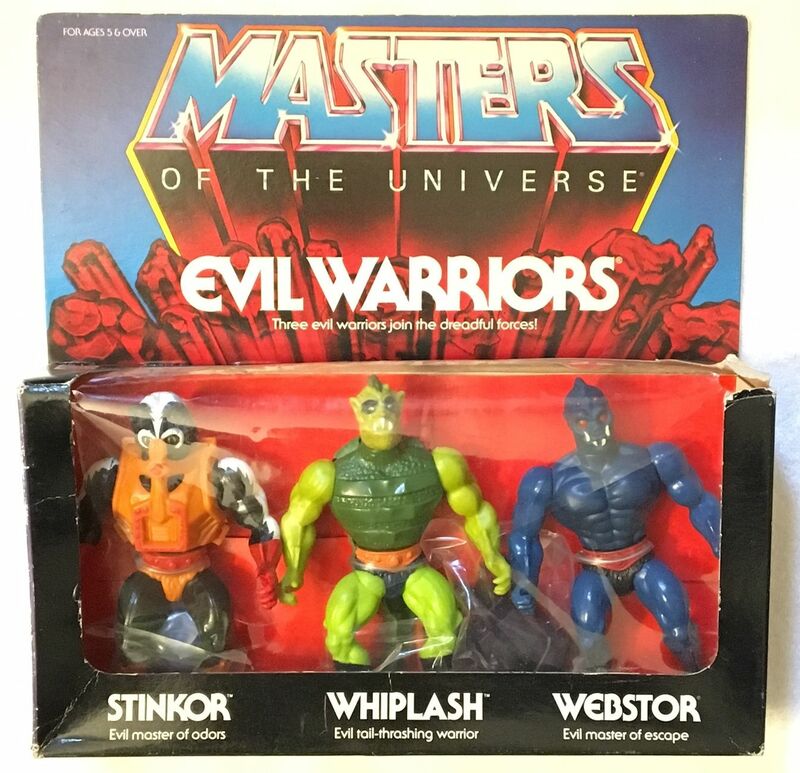 Webstor also appears in Eye of the Storm, which came packed with Snout Spout. 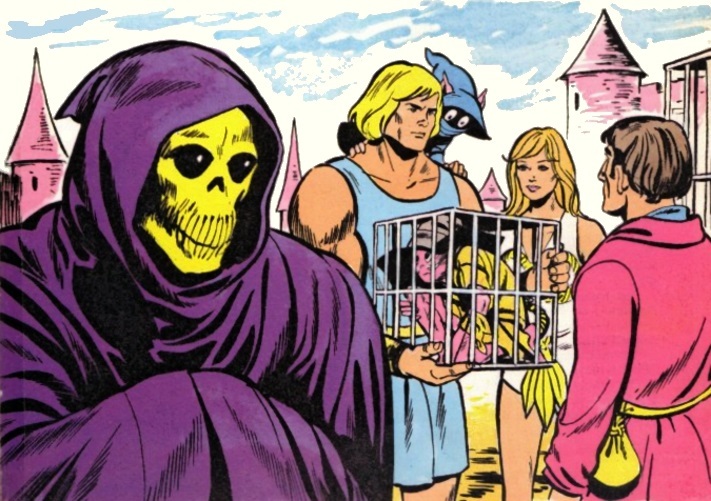 In the story he aids Skeletor in a plot to cause chaotic storms all across Eternia. 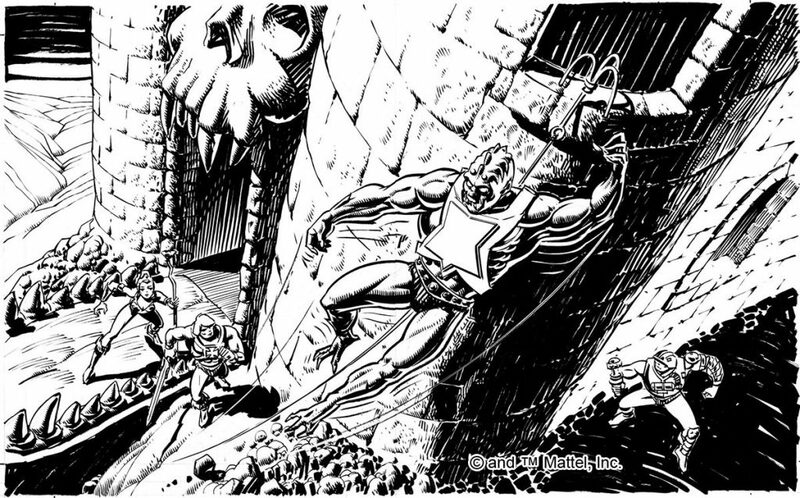 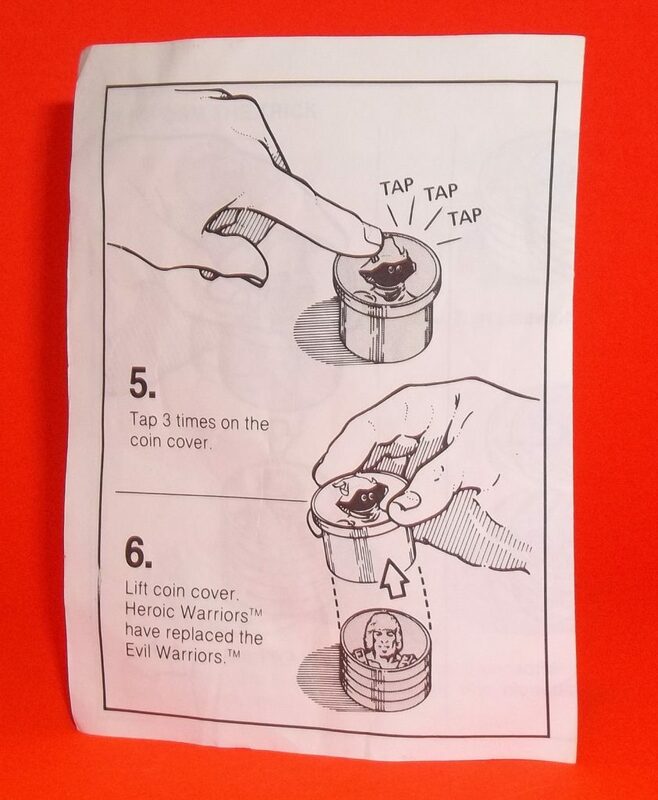 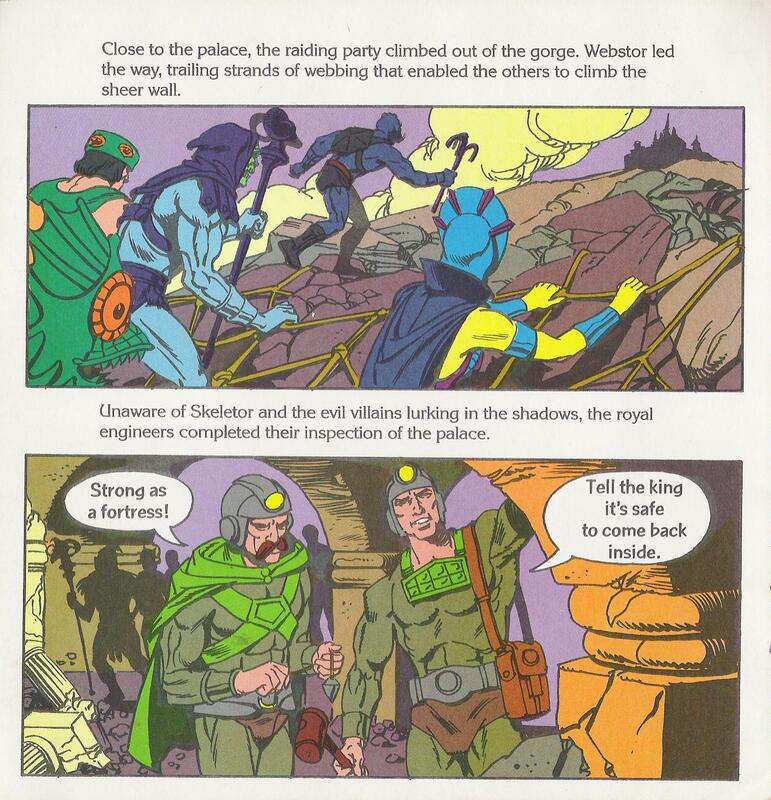 From The Rock Warriors, illustrated by Fred Carillo. 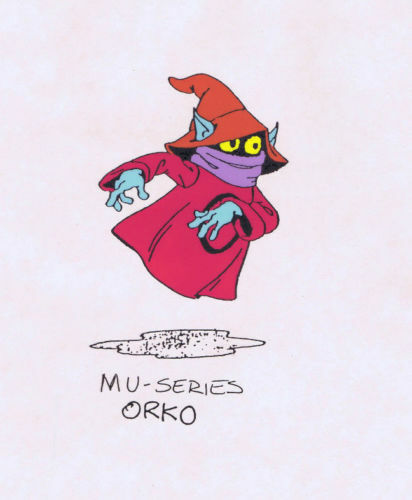 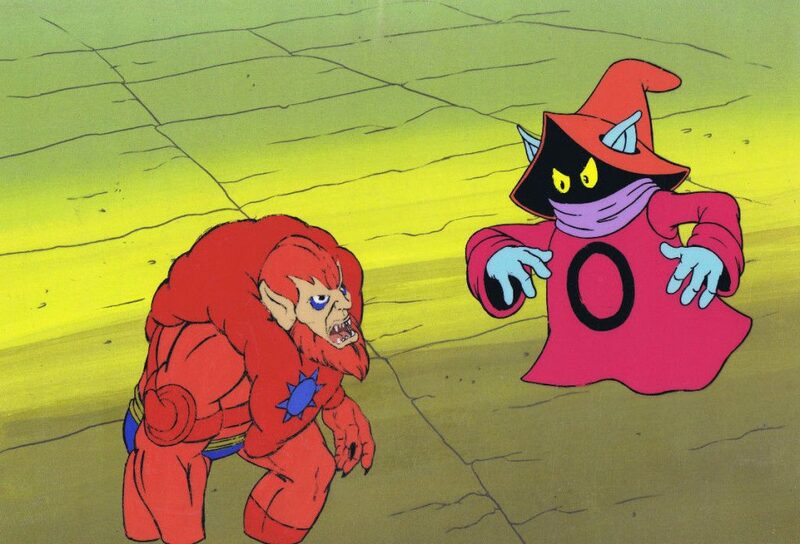 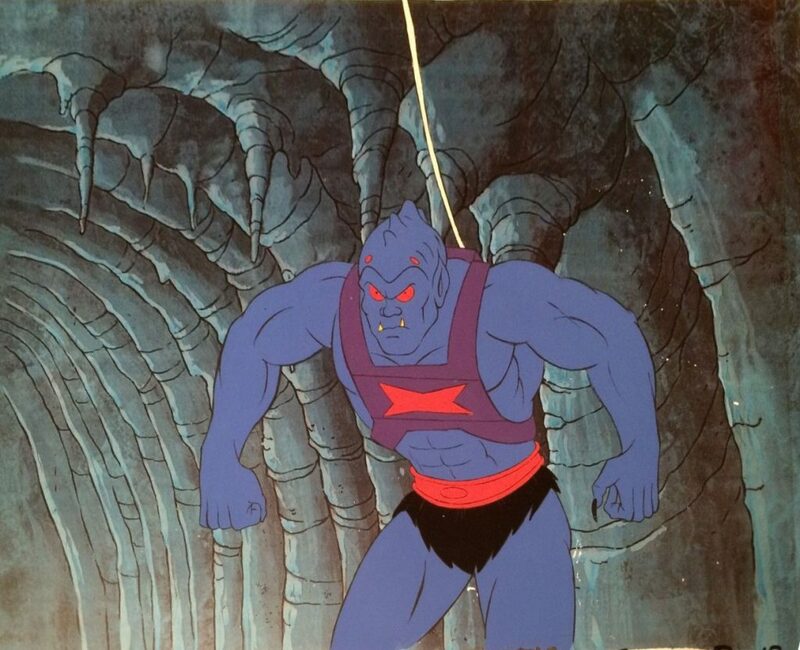 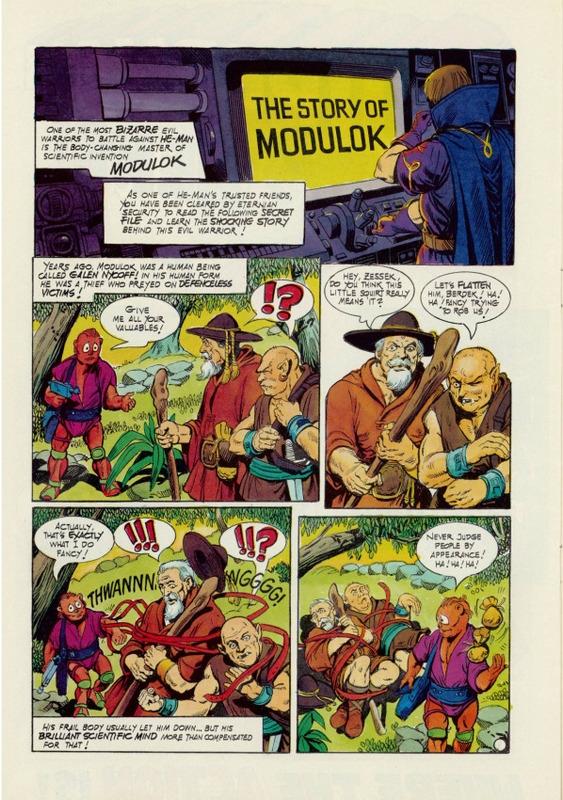 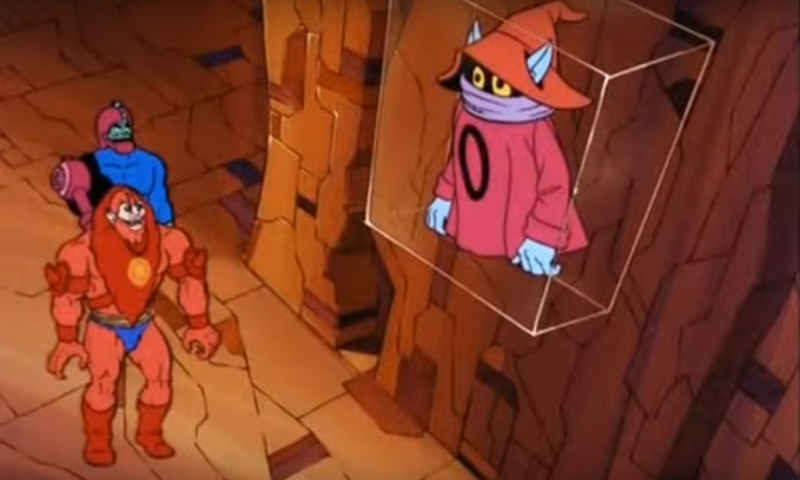 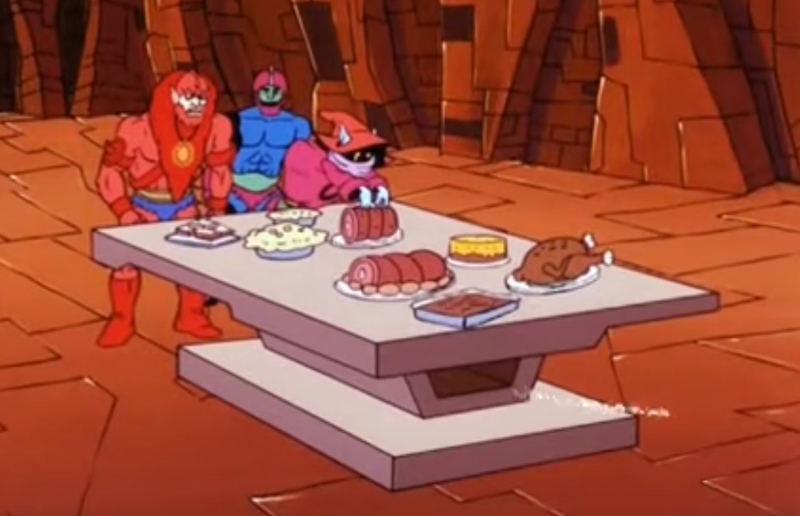 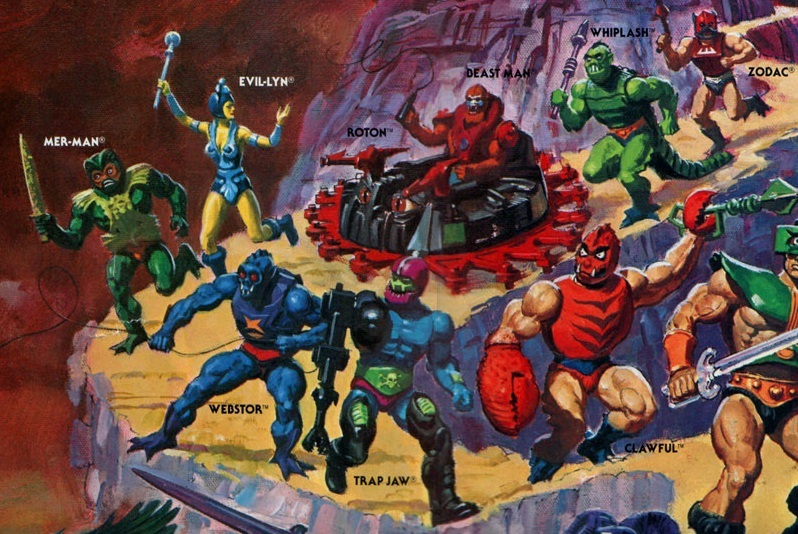 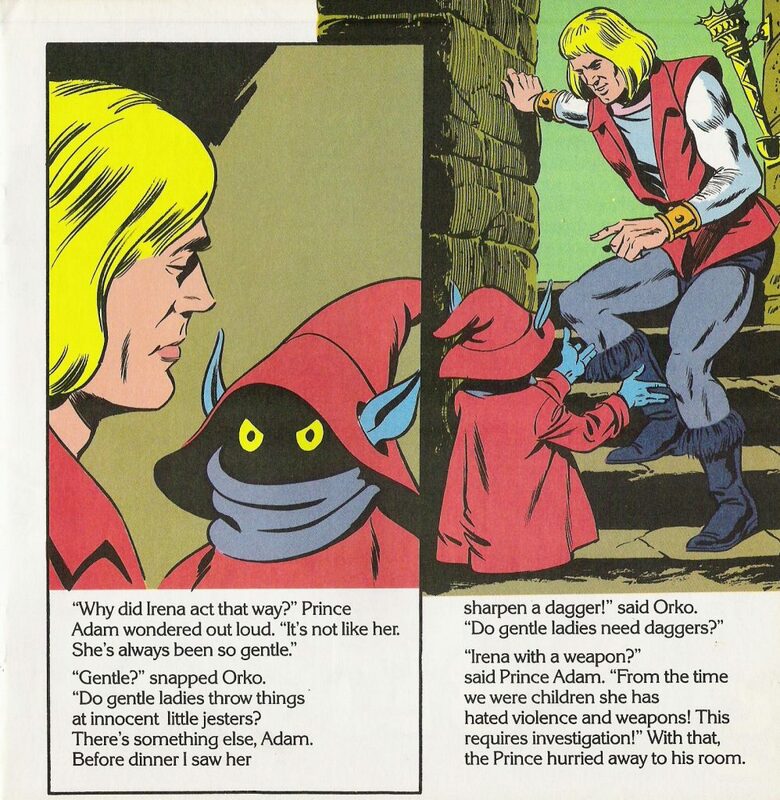 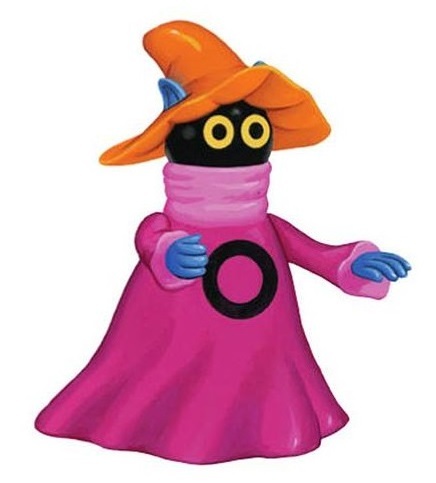 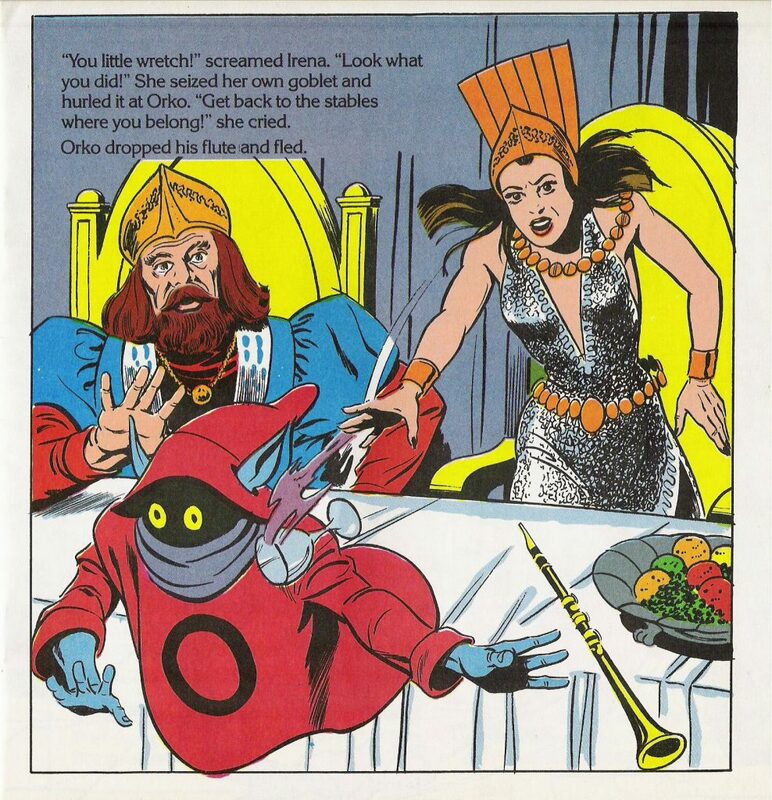 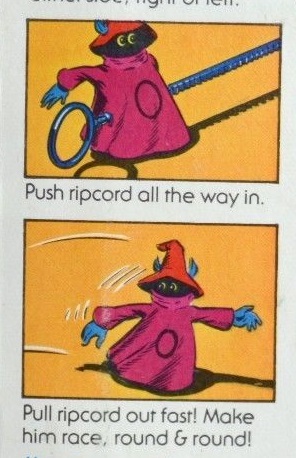 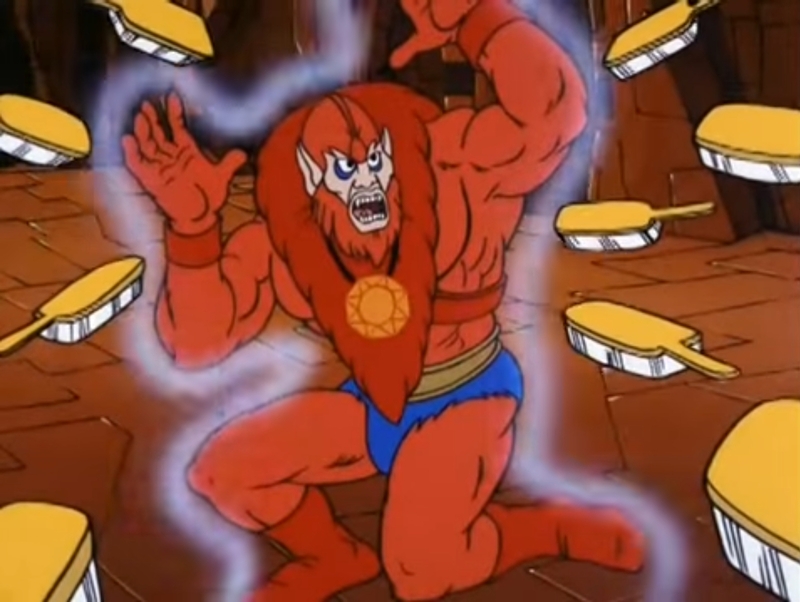 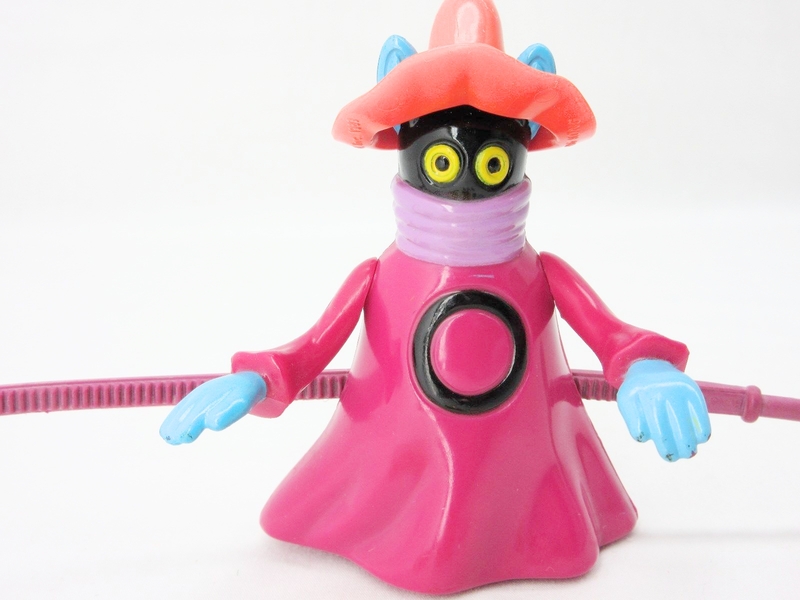 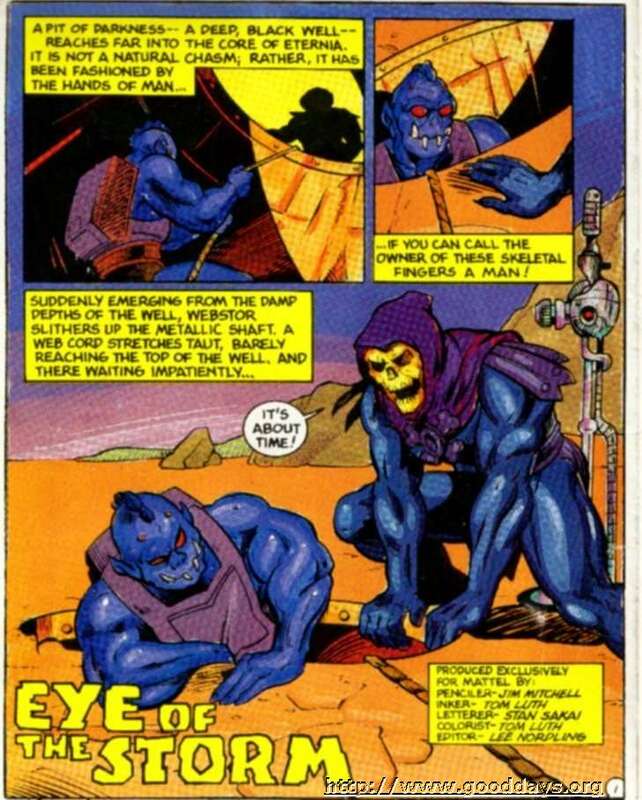 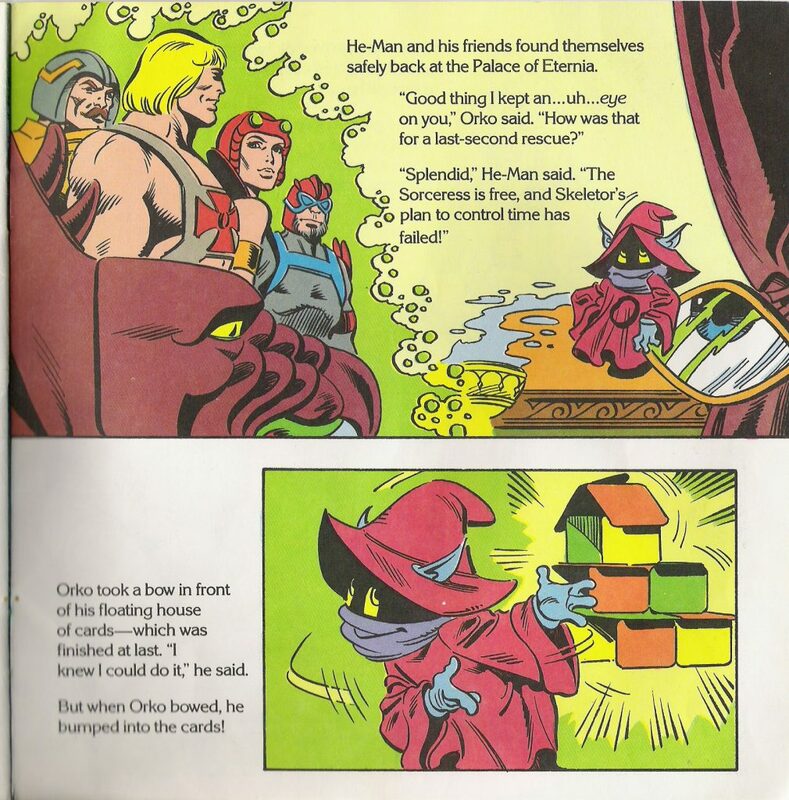 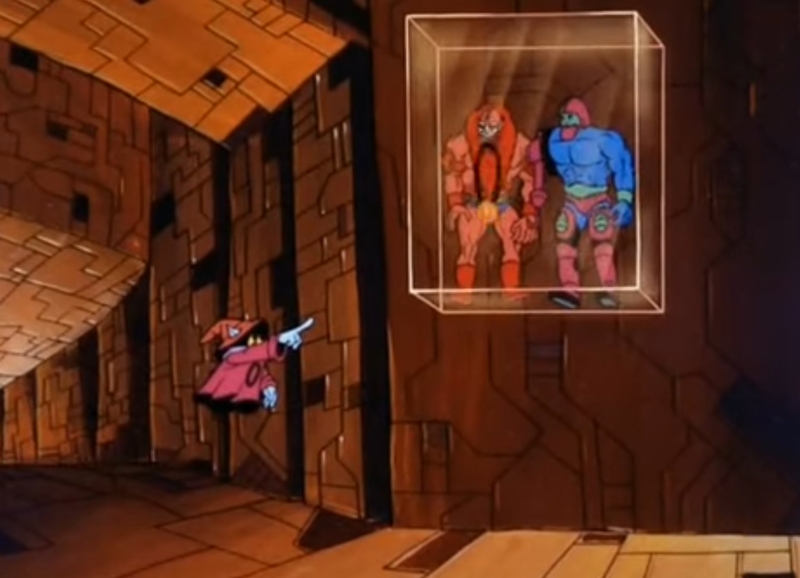 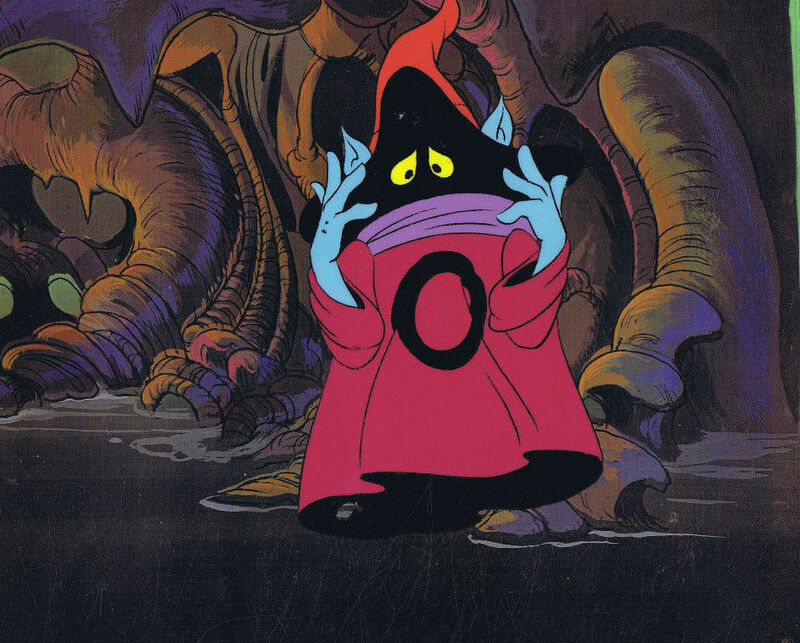 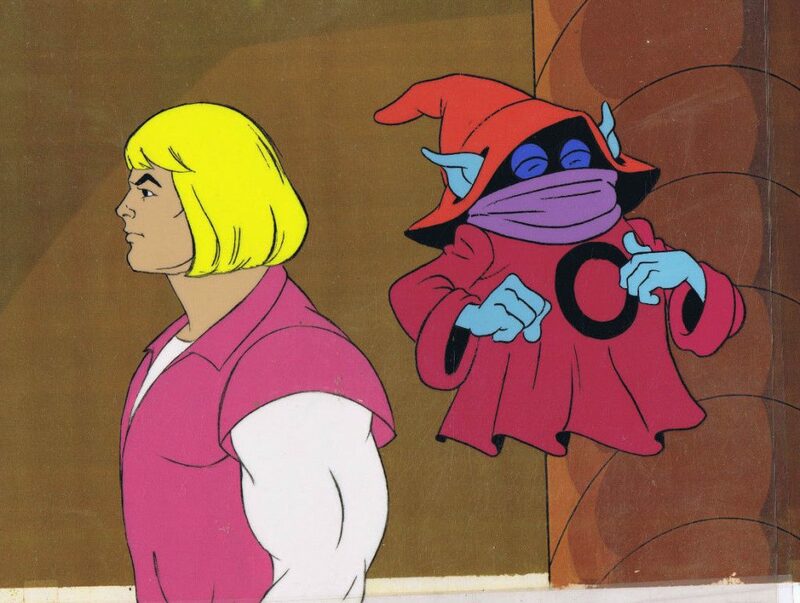 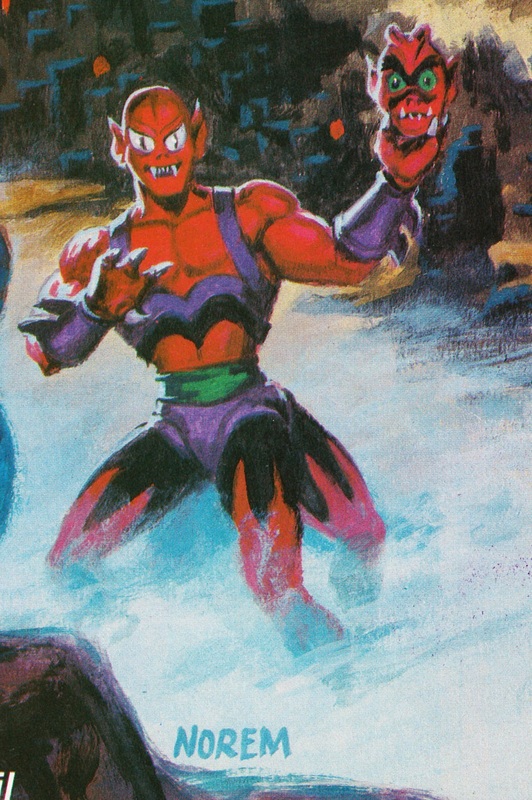 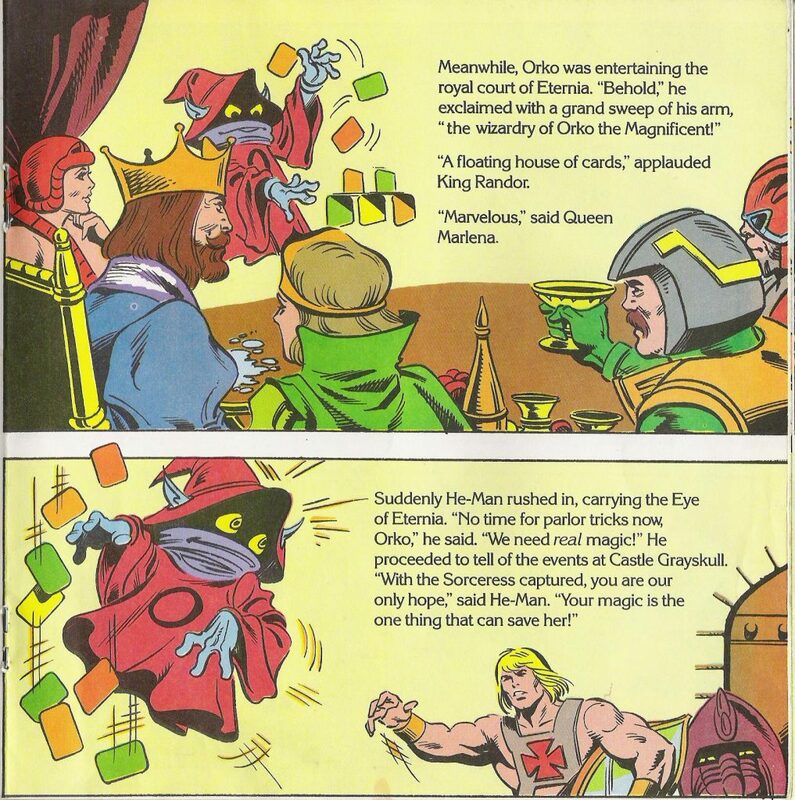 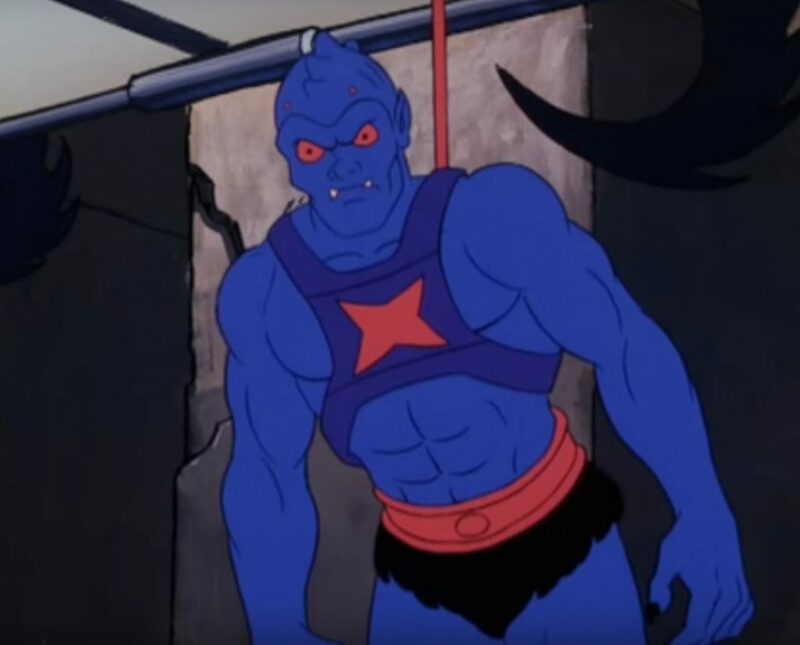 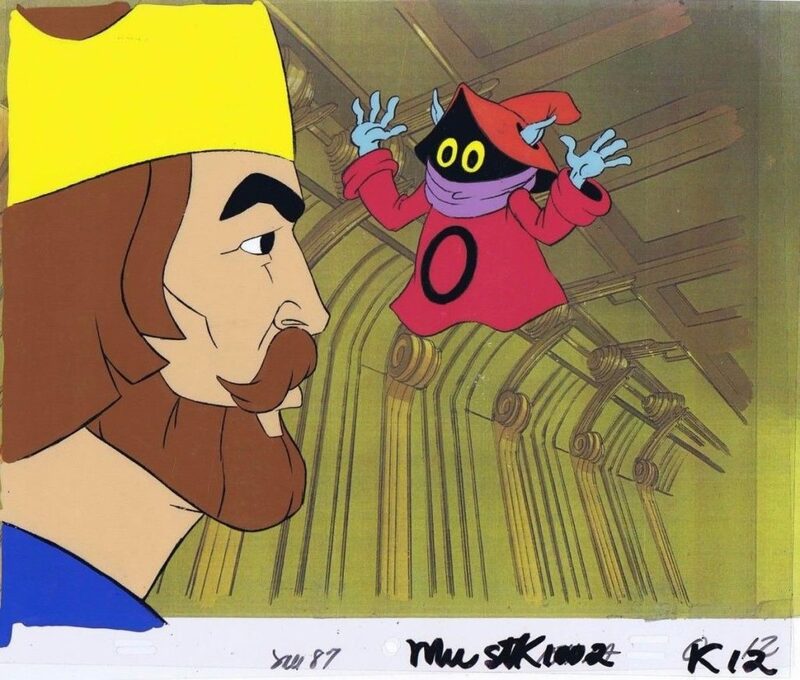 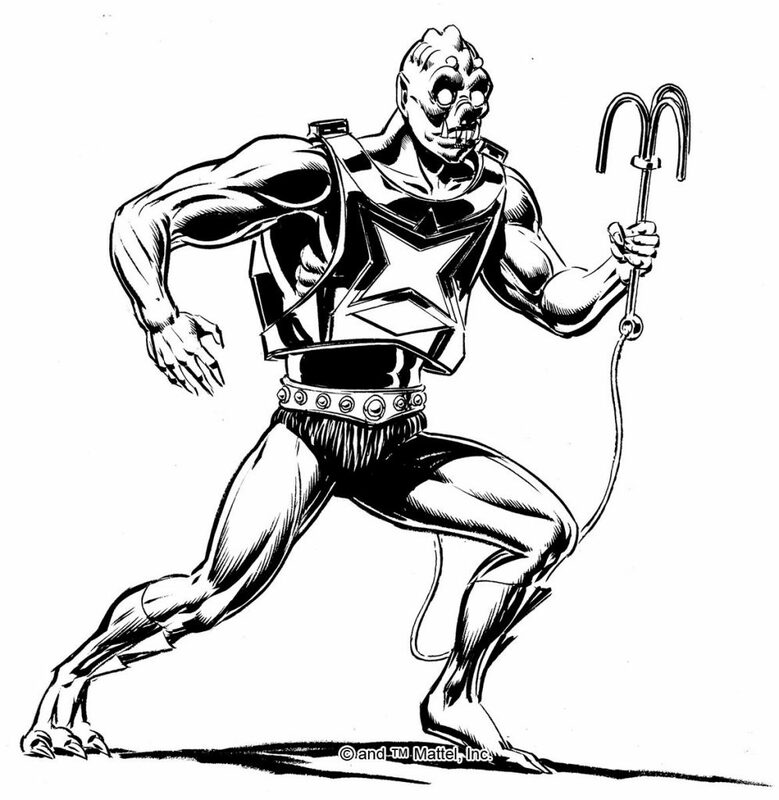 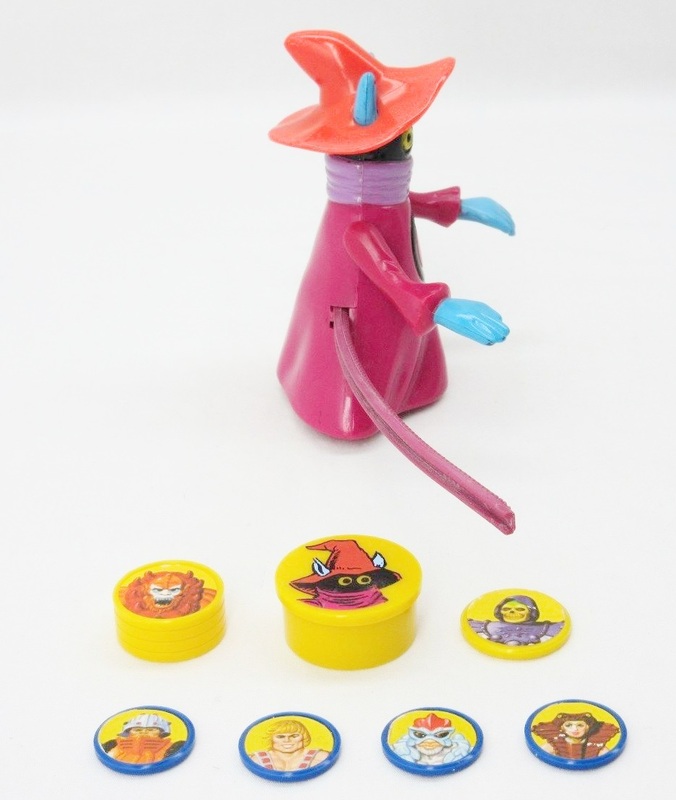 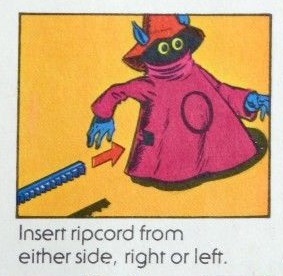 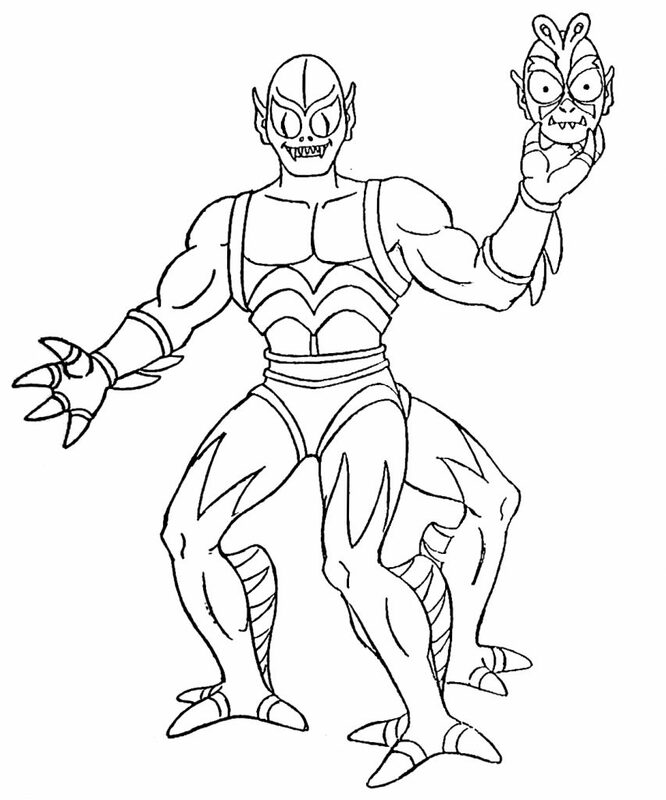 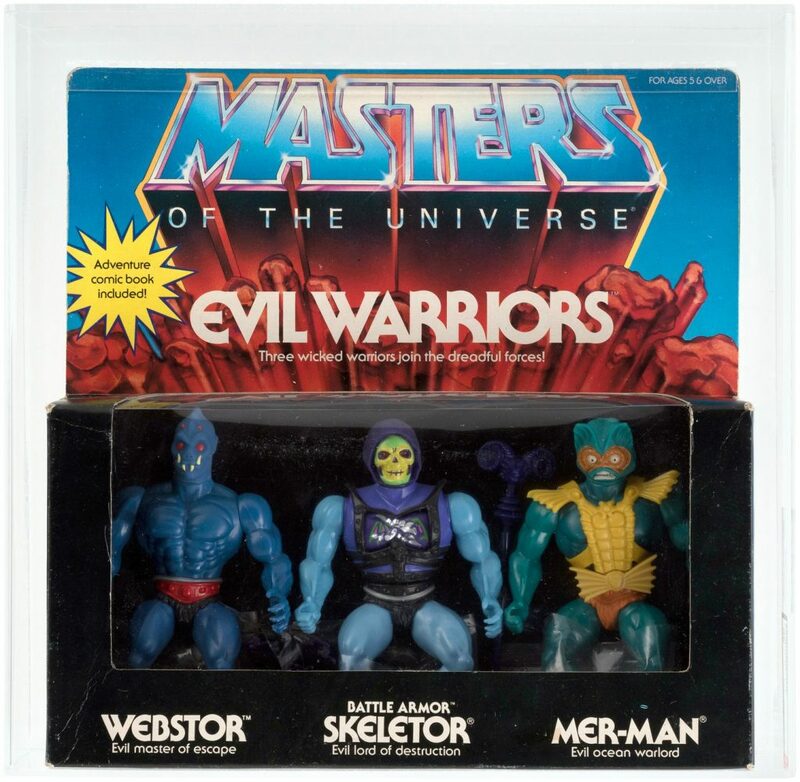 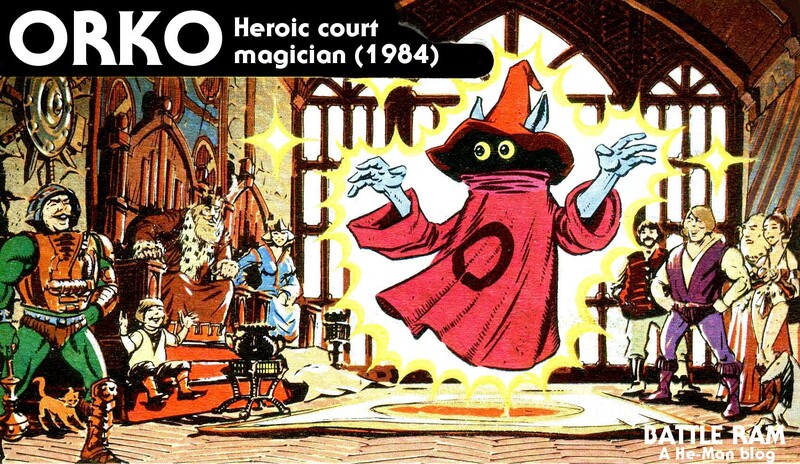 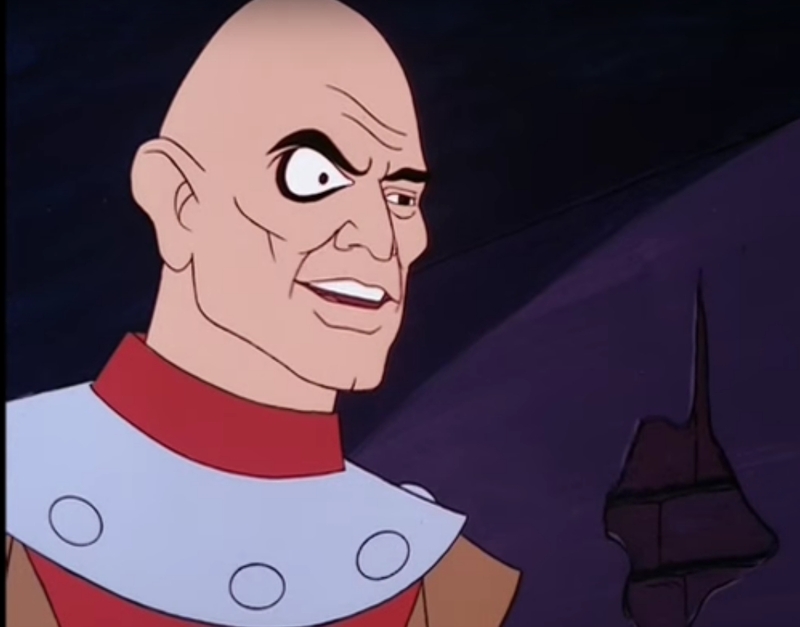 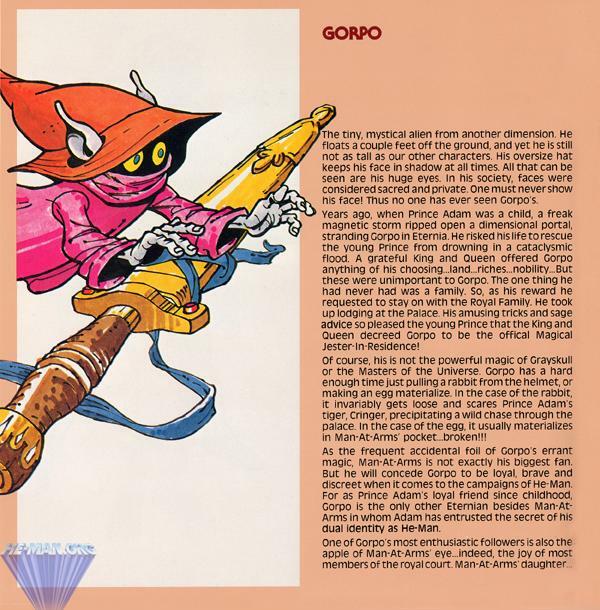 Webstor was portrayed as one of Skeletor’s more intelligent minions in the Filmation cartoon. 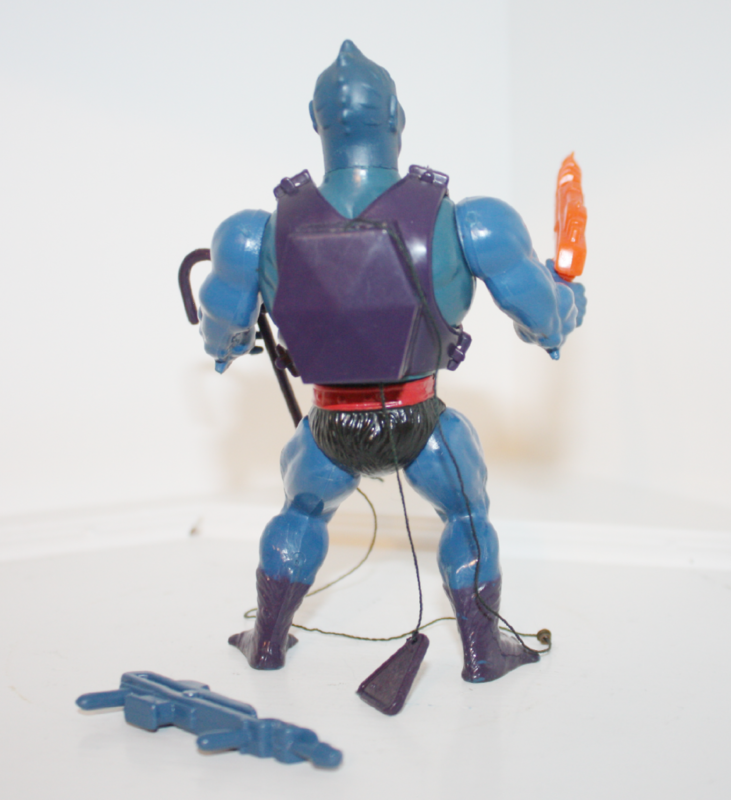 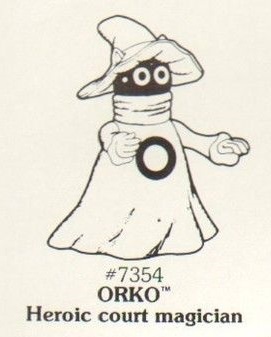 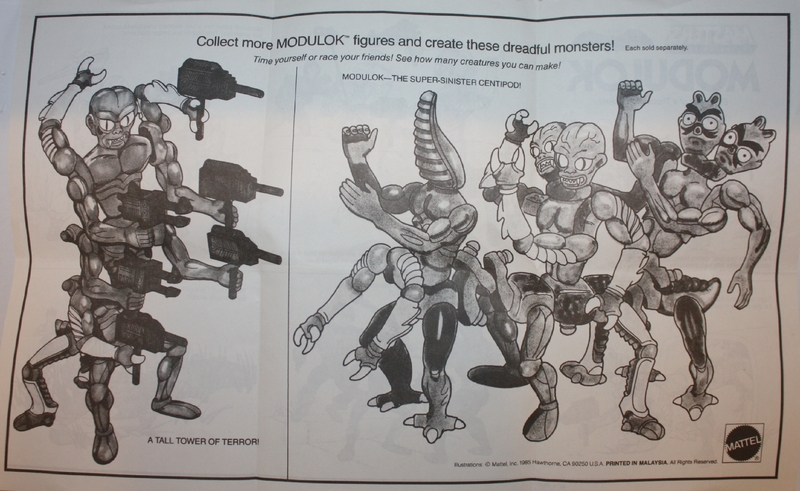 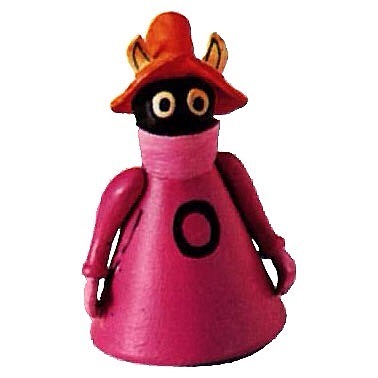 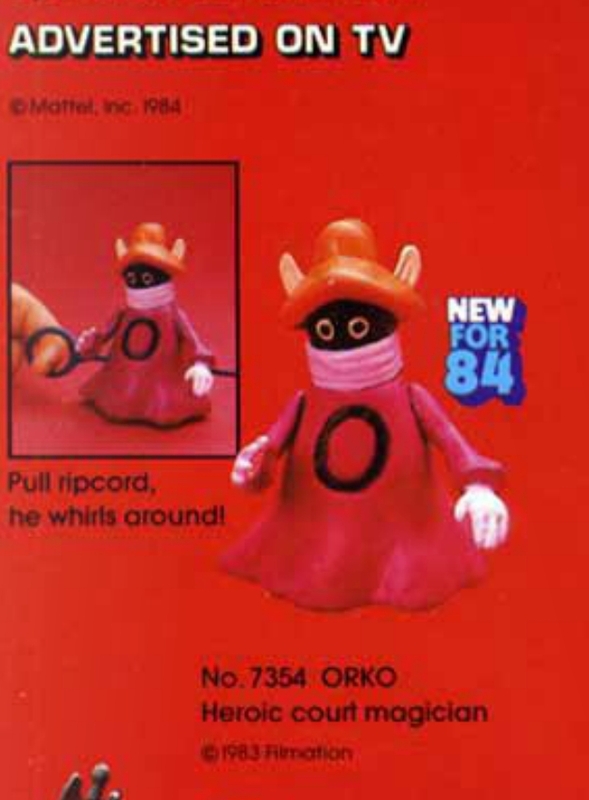 His design was generally consistent with the overall look of the toy, albeit with a few simplified details. 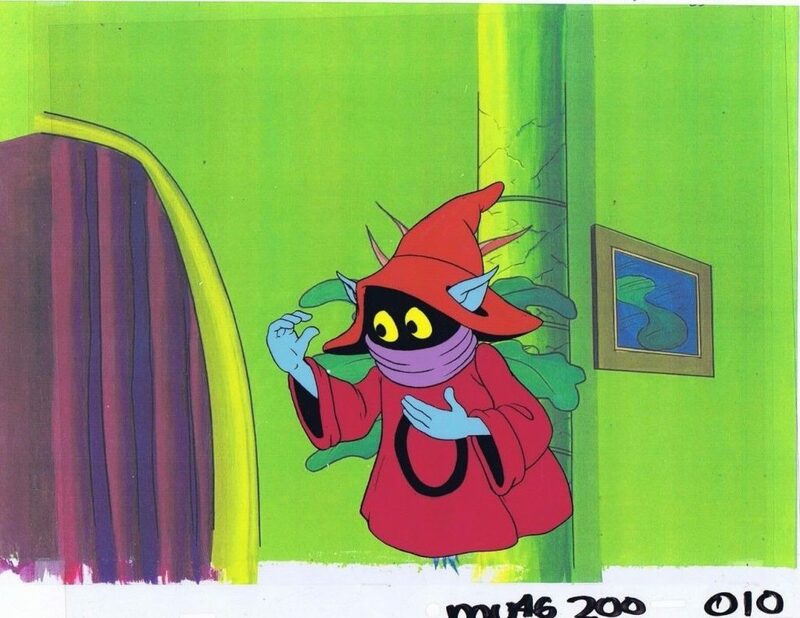 The two most notable appearances, for me at least, were in “The Cat and the Spider” and “Disappearing Dragons”. 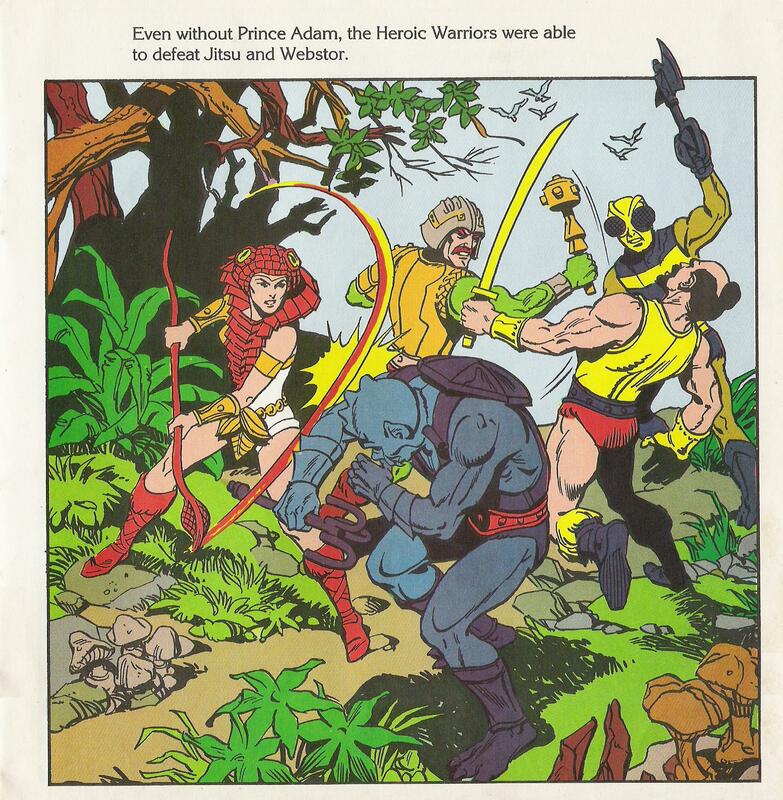 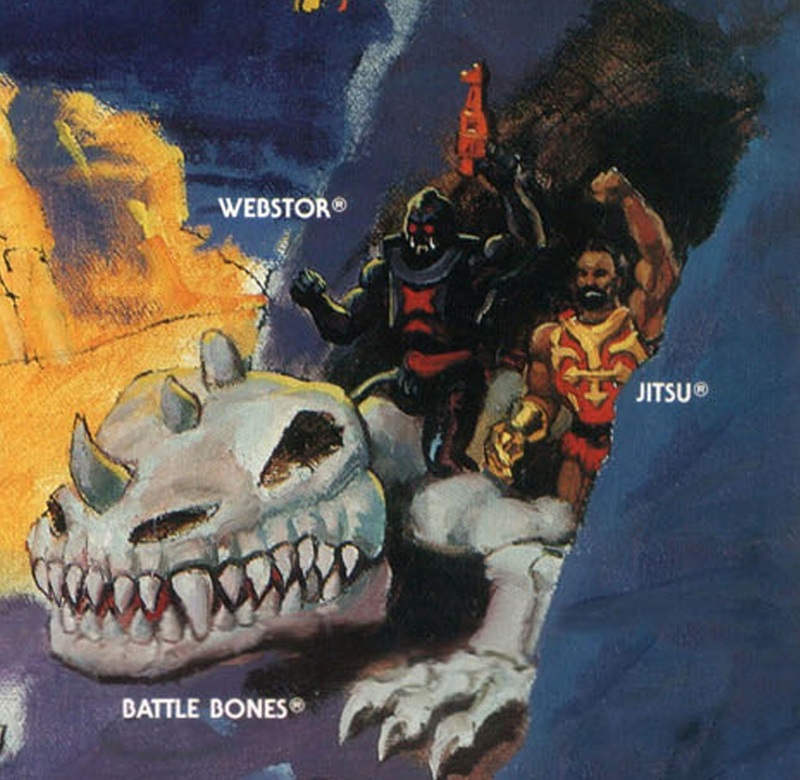 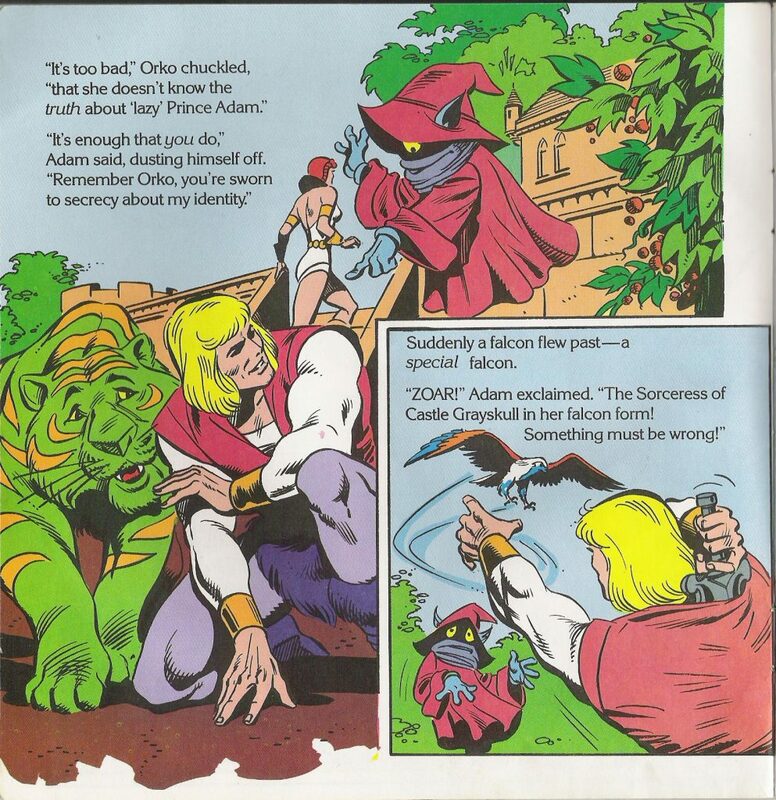 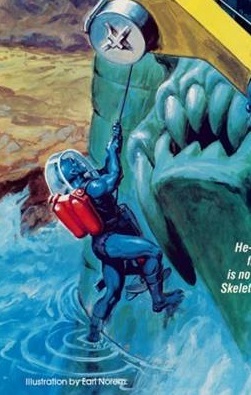 In “Disappearing Dragons,” Webstor teams up with Kobra Khan as they aid Skeletor in kidnapping Eternia’s dragons. 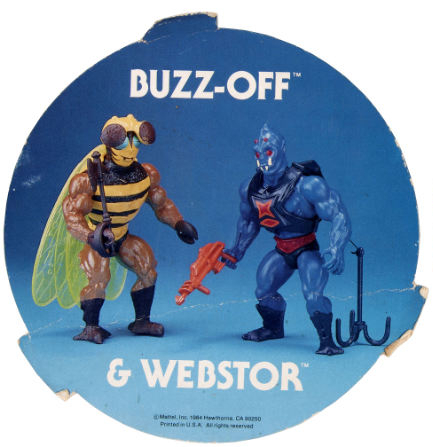 They battle against another pair of characters that frequently work together – Buzz-Off and Mekaneck.